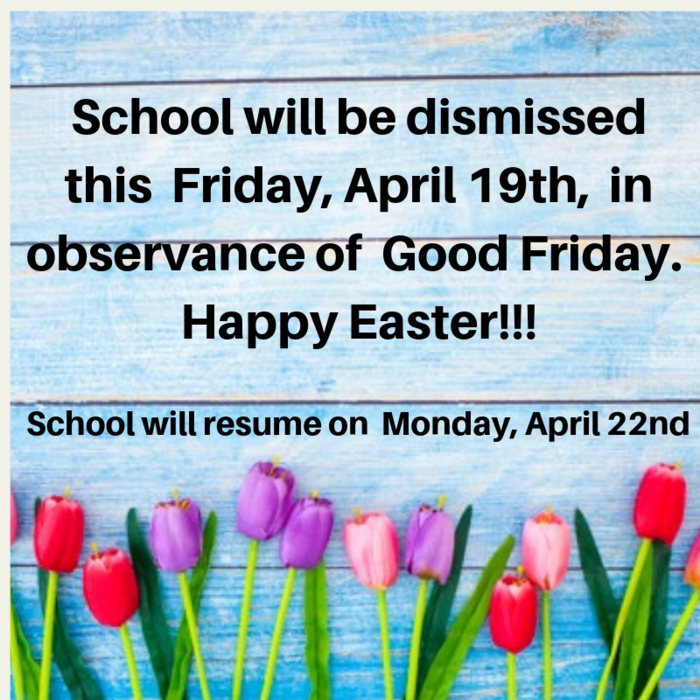 There will be no school on Friday, April 19th in celebration of Good Friday. 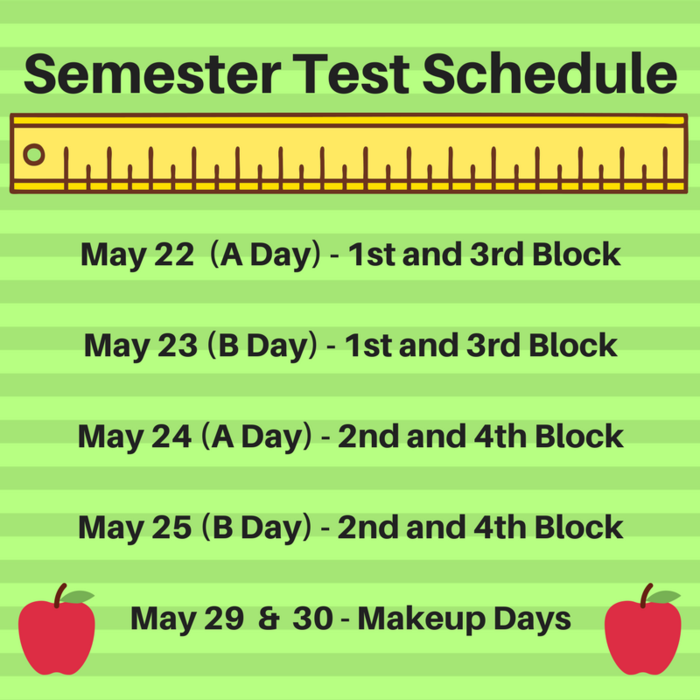 Don’t forget that testing starts tomorrow for 5th grade. 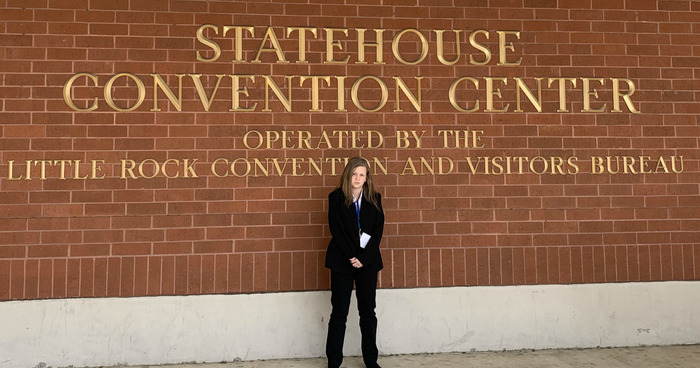 Haley Kelley competed last Monday at the FBLA Mid-Level State Conference in Little Rock, Arkansas. 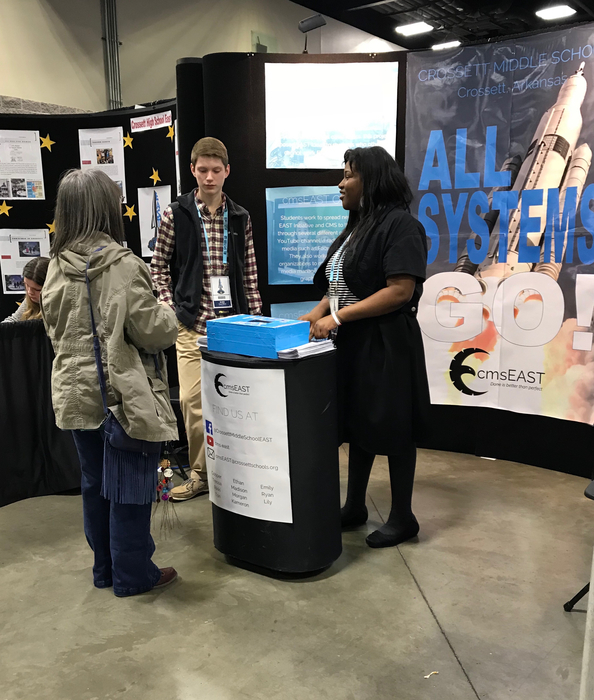 She is the first CMS student to attend the state conference. Last year was the first year that FBLA Mid-Level students could qualify to compete at the state conference. Once again, the CMS band showed out! Forty students participated at Solo and Ensemble competition and they brought home 46 medals! 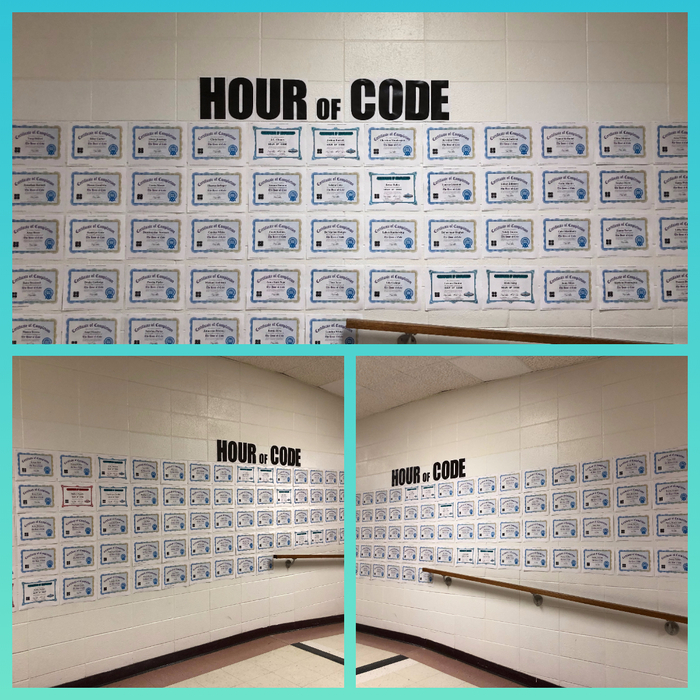 Every single student competing earned a medal! 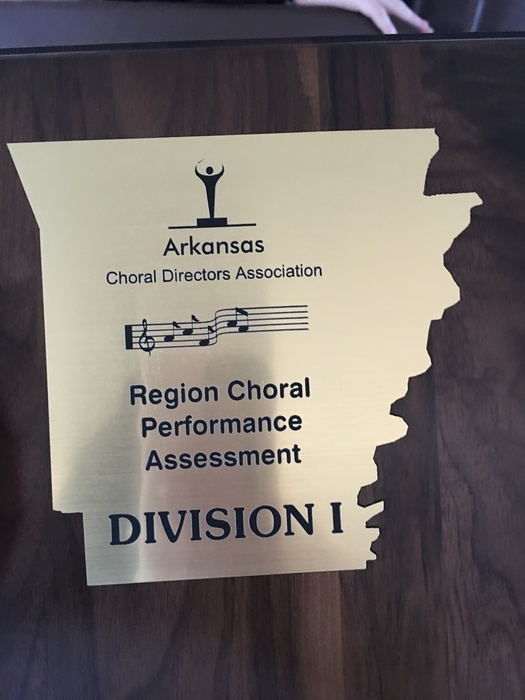 They received 12 - 2nd divisions and an ASTOUNDING 34 - 1st divisions! Congratulations CMS Band and Mr. Waschalk!!!! 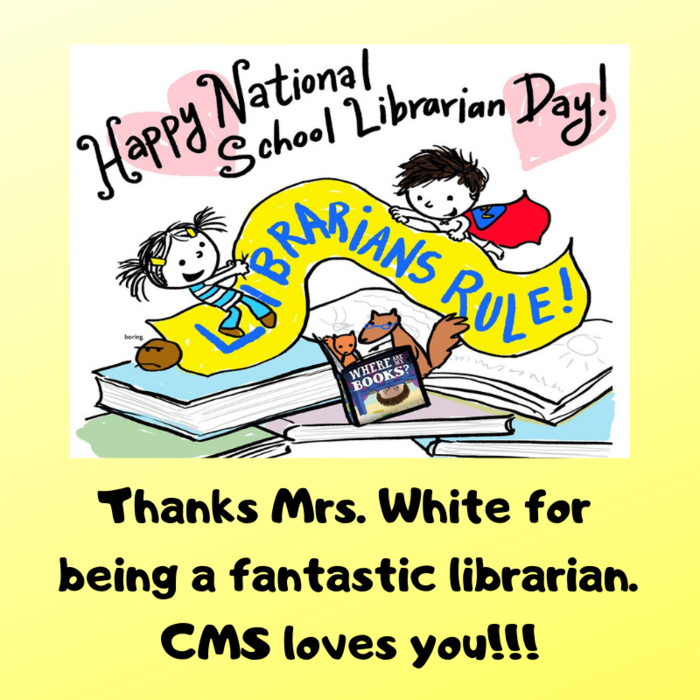 Happy National School Librarian Day!!! Report cards for the 3rd 9 weeks will be sent home with students today!!! CMS students enjoyed Brian Housman's presentation on digital involvement and internet safety today in the new CHS auditorium. The CMS band will host a 5th grade recruitment day on Wednesday, April 17 at 2:30 in the CMS cafeteria. 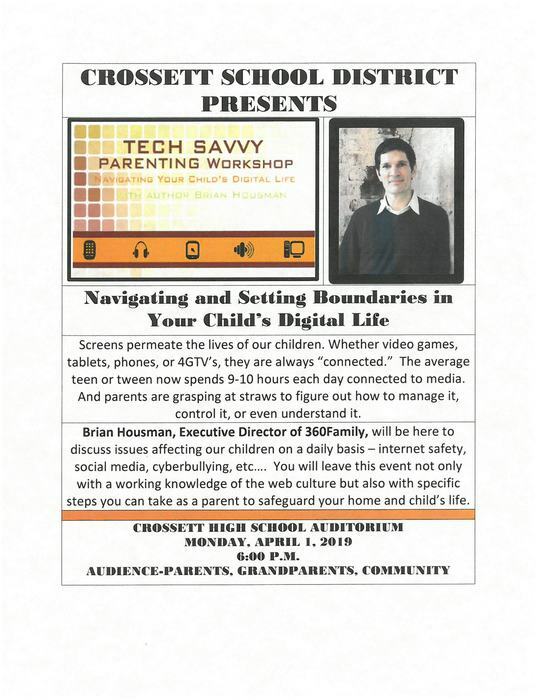 We will show a short video and a Q & A for students and parents. 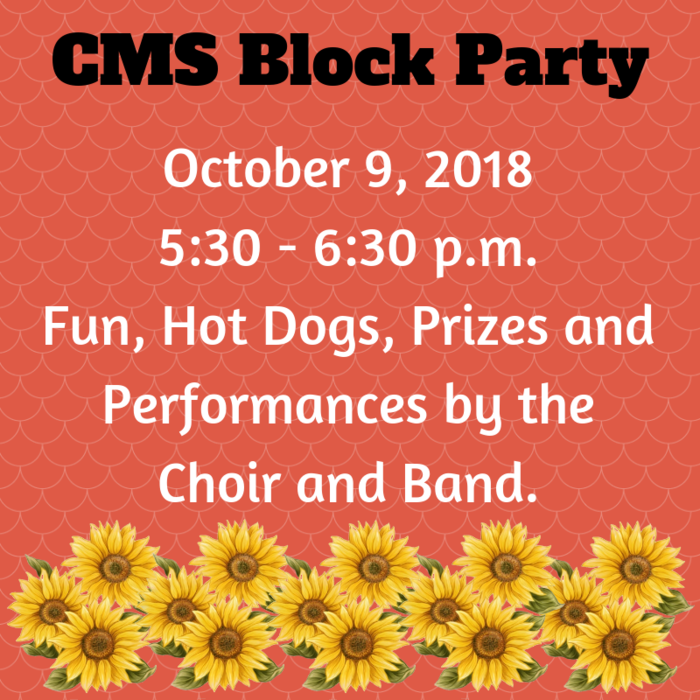 The CMS band will also perform. 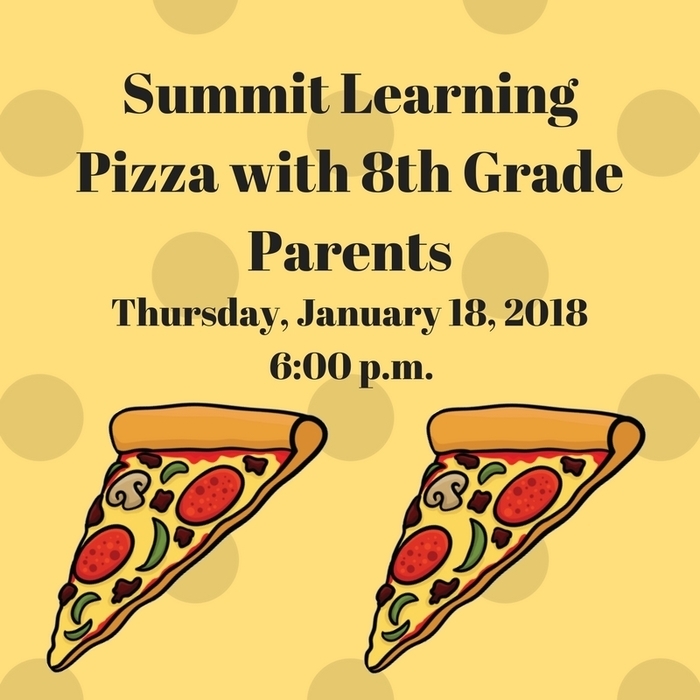 Any parent of a 5th grade student who is interested, is welcome to attend. 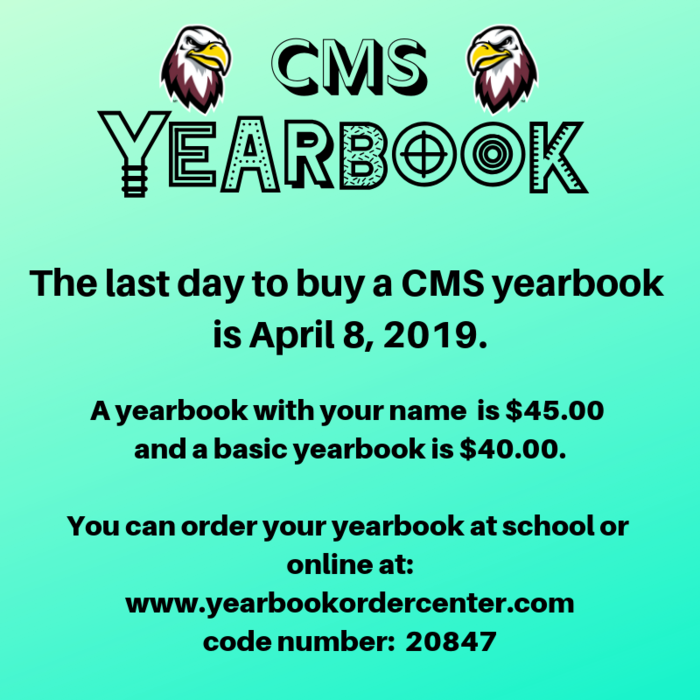 Last day to order a yearbook is April 8, 2019. Congratulations Trinity! Good luck at the National Spelling Bee!!! Spring Pictures will be April 2nd. The pre-paid order form will be sent home later in the week. School resumes tomorrow, March 25th. It will be a “B” day!!! See you in the morning!!! CMS will be dismissed March 18 - 22, 2019 for Spring Break!!! 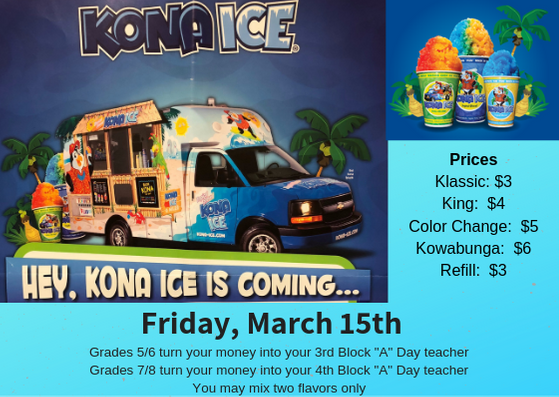 Kona Ice is coming to CMS on Friday, March 15, 2019. 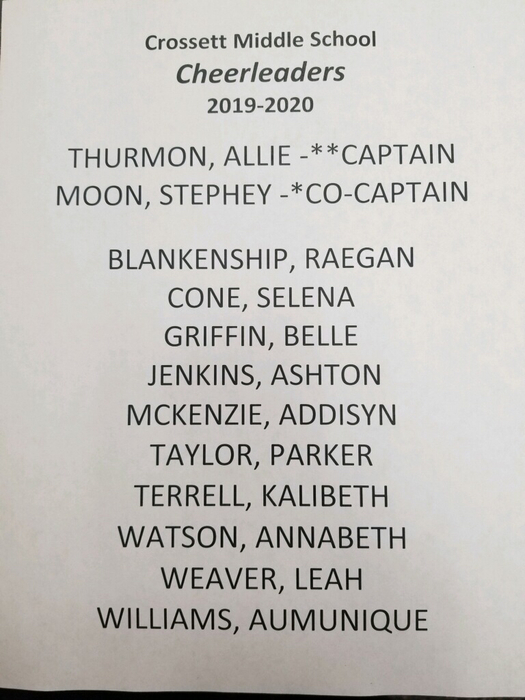 Congratulations to the 2019-2020 CMS Juniorettes!!! 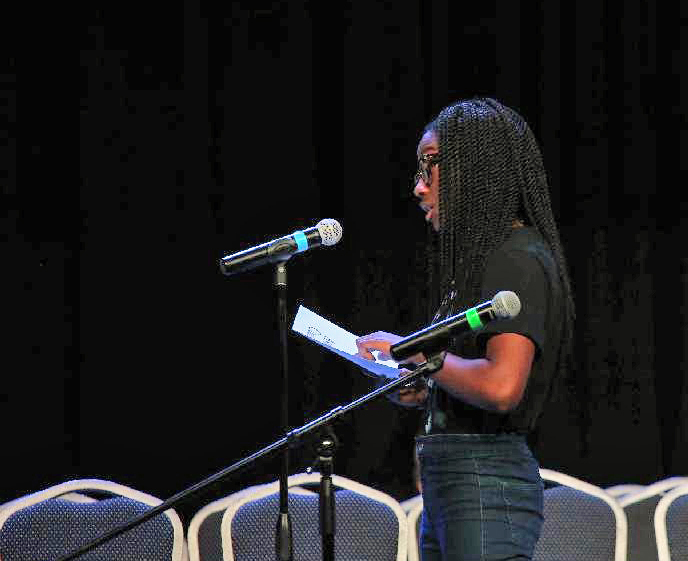 Congratulations to Trinity Foster for placing 4th in the State Spelling Bee!!! 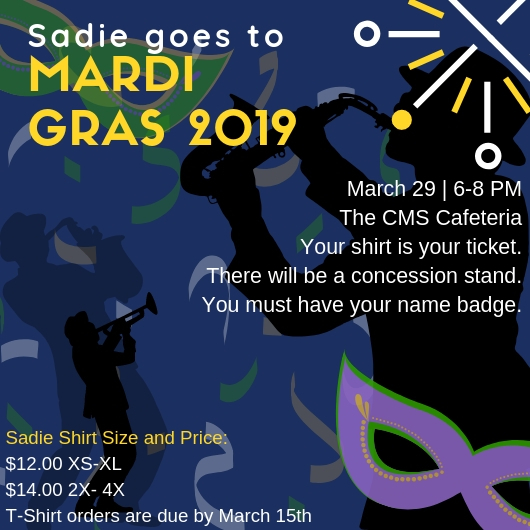 The deadline to order your t-shirt for the Sadie Hawkins dance is March 15, 2019. 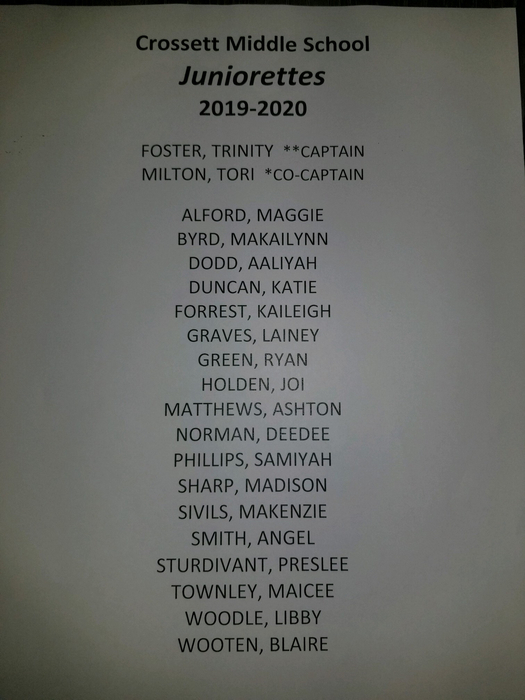 Congratulations to the 2019-2020 CMS Cheerleaders!!! 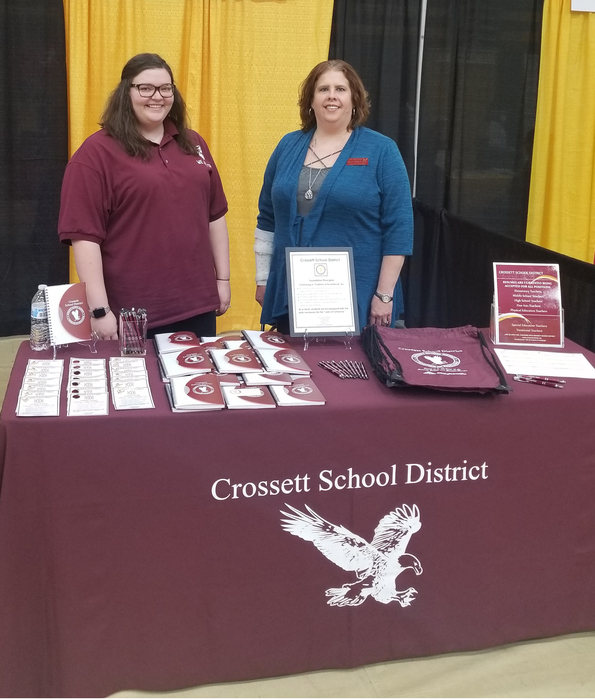 Ms. Spradlin and Mrs. Hogue are attending the UAPB Career Fair today to help recruit new teachers to our district. 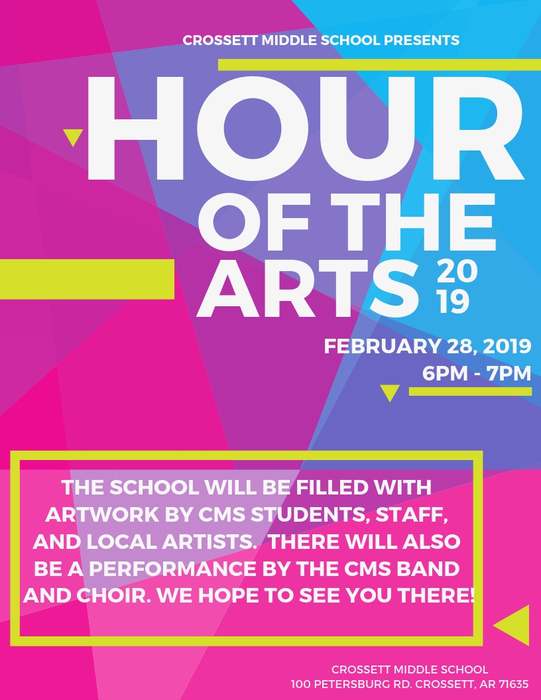 Don't forget about the CMS Hour of Arts this week. 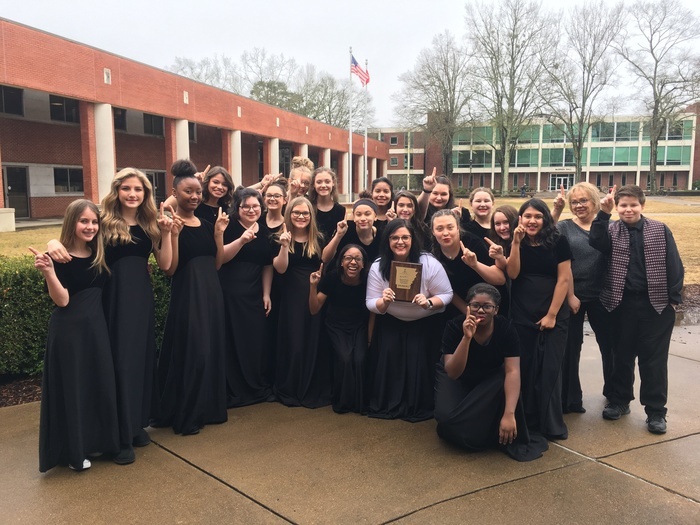 Congratulations to the CMS Choir for receiving all 1s at the Region Choral Performance Assessment today in Arkadelphia. Way to go choir and Mrs. Pippen!!!! 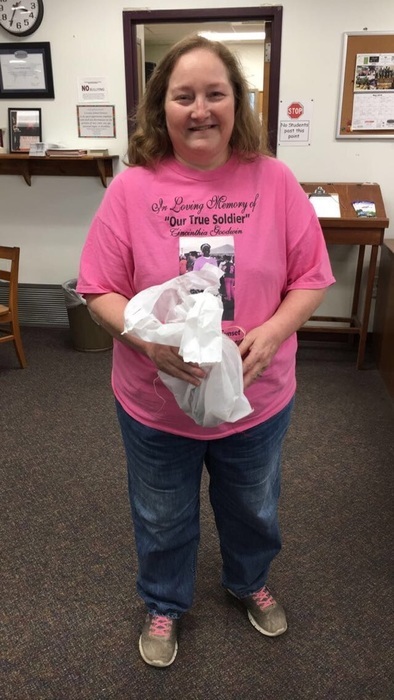 Mrs. Gibson’s classes were listening to Linda McDougald, RN, talk about CPR, stroke symptoms and heart health as they prepared Heart Healthy information for her presentation at New Bethel church. 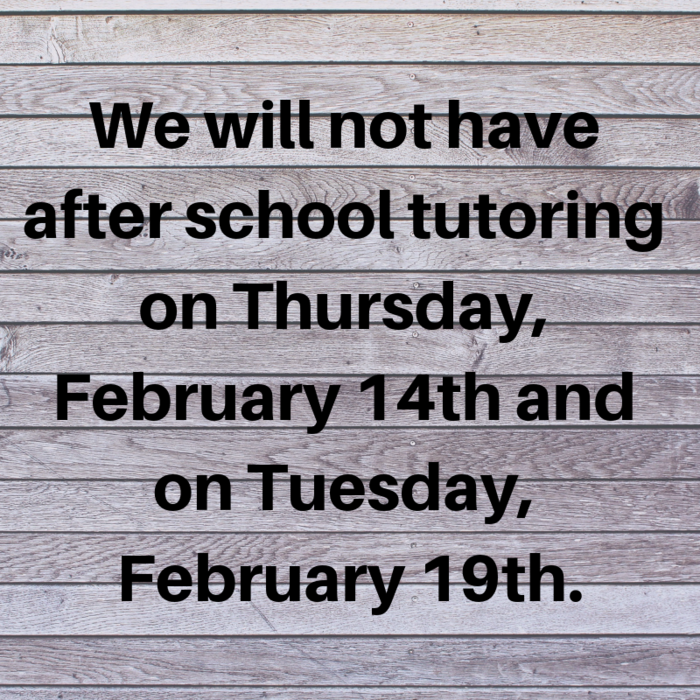 No Tutoring on February 14th and February 19th. Congratulations to the Region 12 ANASP First Place Team!!!!!!! Way to go CMS Archery!!! 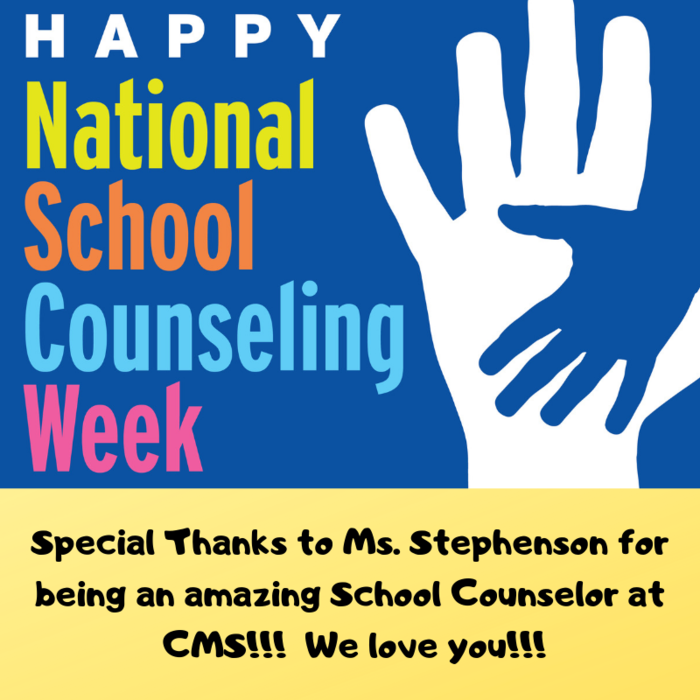 Happy School Counselor Week, Ms. Stephenson!!!! 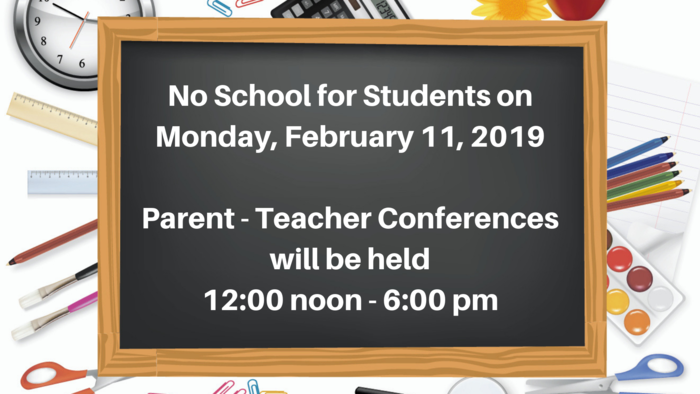 No school for students on Monday, February 11th. Parent-Teacher Conferences will start at 12:00 noon and end at 6:00 pm. 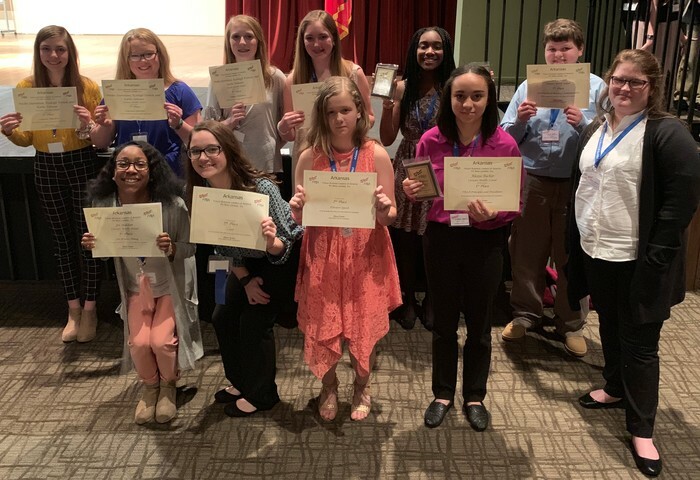 Congratulations to the following CMS FBLA students on placing in multiple events at the Spring Leadership Conference today. 1st - FBLA Principles and Procedures: Alexia Tucker; 1st - Introduction to Parliamentary Procedures: Trinity Foster; 1st - Public Speaking: Trinity Foster; 2nd - Computer Slide Show: Kaileigh Forrest, Karlee Johnson, and Preslee Sturdivant; 2nd - Creed: Kaylee Hays; 2nd - Elevator Speech: Haley Kelley (She has also qualified to compete at the FBLA State conference in April); 2nd - Three Minute Timed Writing: Tori Milton; 5th - Introduction to Business Communications: Zach Cooper; and 5th - One Minute Timed Writing: Joi Holden. CMS Valentine's Day dance for 5th and 6th grade. 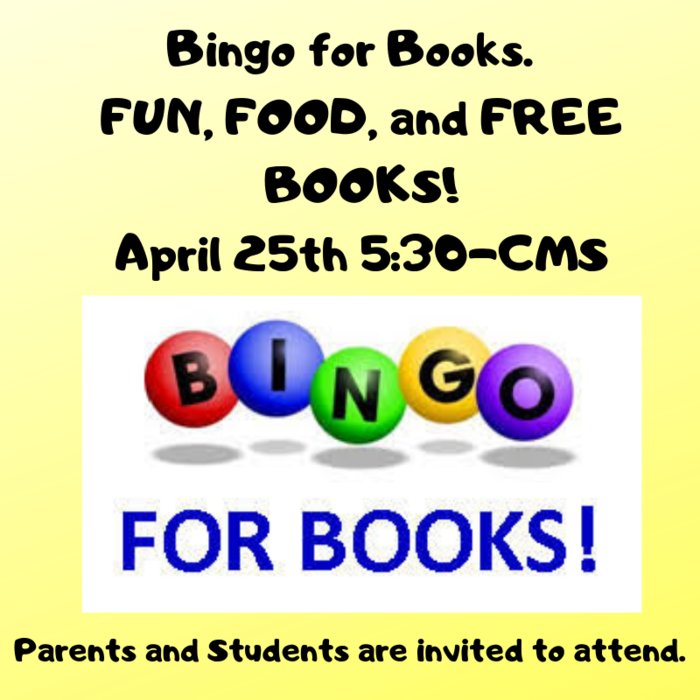 CMS Book Fair is coming soon!!! In observance of Martin Luther King Day, students will not attend school on Monday, January 21st. 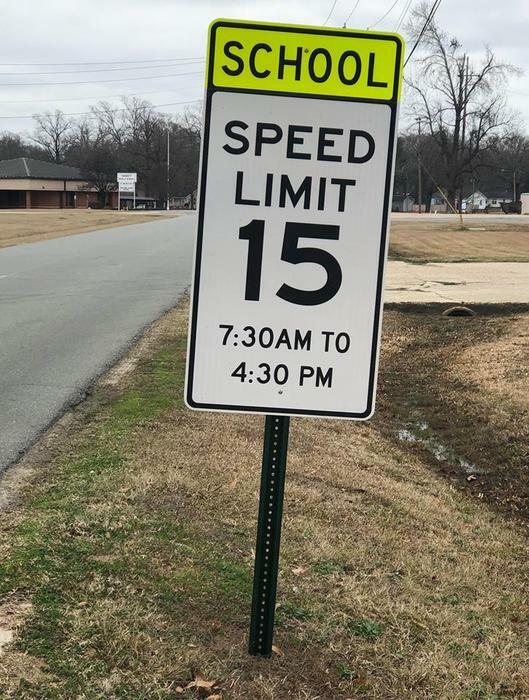 Important notice: the speed limit is now 15 mph on Coach Ed Johnson Road between the hours of 7:30 am - 4:30 pm. 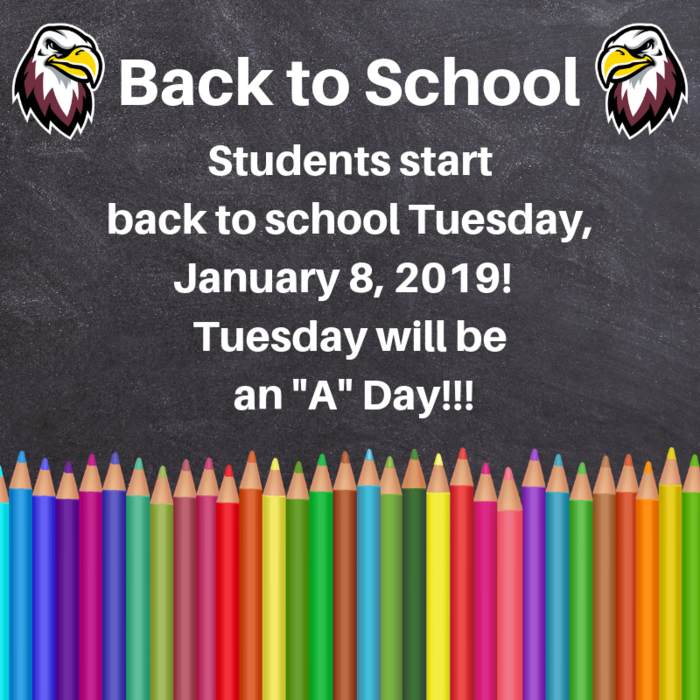 School resumes on Tuesday, January 8th. We are excited to begin a new year and new semester!!! Congratulations to the CMS Spelling Bee winners. Trinity Foster was the overall winner and Tressa Richards was the runner-up!! Great job girls!!!! Due to the Christmas Parade tomorrow (December 11) after school tutoring will be cancelled. December 13th will be the last day of tutoring for 2018. We wish each family a very Merry Christmas and a Happy New Year! We will resume tutoring on January 10, 2019. Congratulations to the following students for earning All-Region honors this past weekend. Flute: 1st band 2nd chair - Emma Parker, 1st band 11th chair - Emily Lemley and 2nd band 4th chair - Libby Woodle. Tenor Sax: 1st band 1st chair - Leah Weaver. Tuba: 2nd band 7th chair - Bryce Bailey. Bass clarinet: 1st band 4th chair - Anna Lemley. Clarinet: 2nd band 2nd chair - Annabeth Watson. Trumpet: 1st band 3rd chair - Colin Martin and 2nd band 6th chair - Savannah Goyne and Percussion: 1st alternate Drew Johnson. C M S phones are now working. The problem has been resolved. Thank you for your patience. 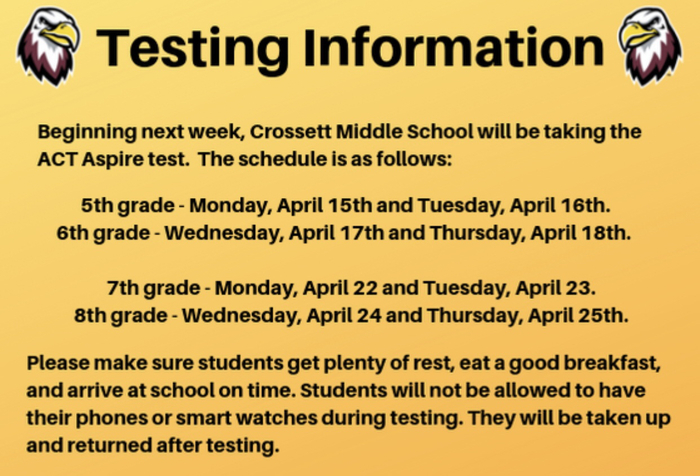 Crossett Middle School phones are down at the moment. Please be patient as we resolve the problem with our phones. C M S students and staff members are asked to donate food items for our annual Canned Food Drive, November 5th through 15th. All donations will benefit local families served by the Crossett Area Food Pantry. Please help us reach our goal of 1000 food items. Thank you. Congratulations to Mr. Waschalk and the CMS Band for winning the Red Ribbon door decorating contest. Special thanks to all of those that voted for their favorite door! 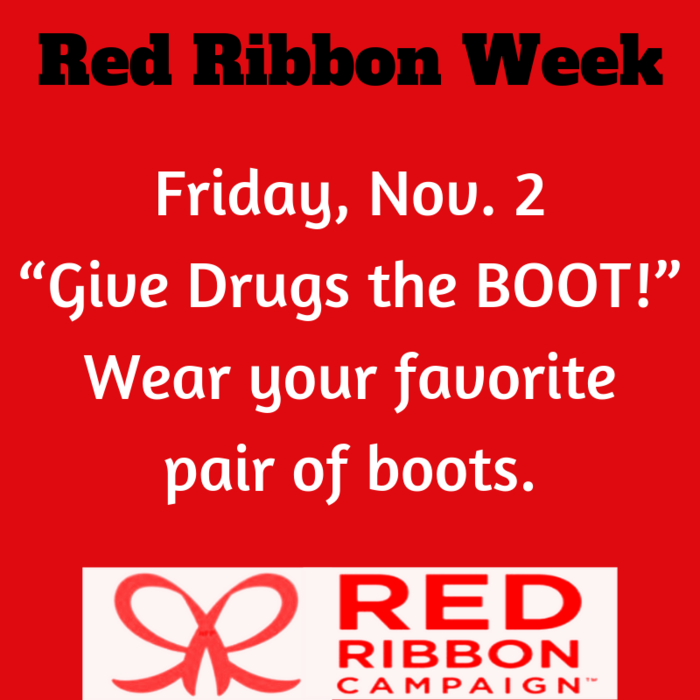 Friday, November 2nd is Give Drugs the Boot!!! Thursday, November 1st is "Winners Don't do Drugs!" Represent your favorite team. 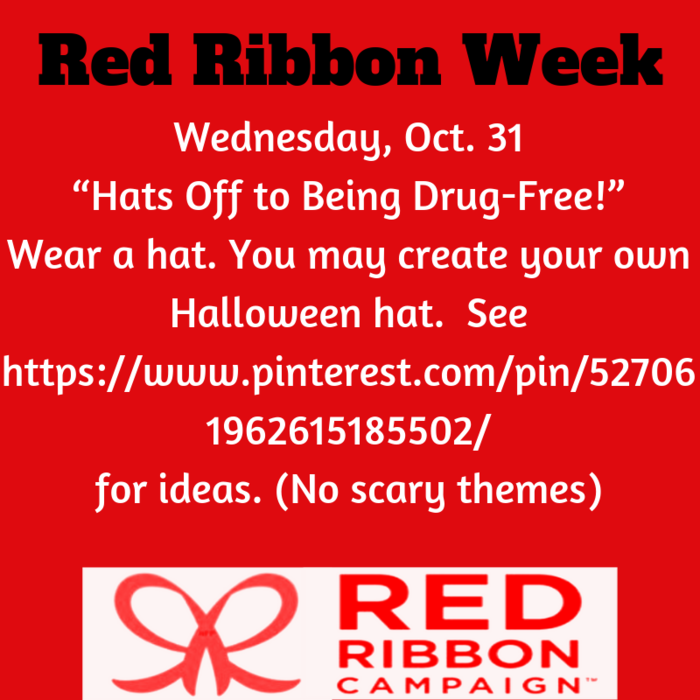 Wednesday, October 31st is Hat's Off to being Drug Free!! Brea Pruett making Crossett Eagles cookie cutters for rival week! Also, working on creating a robot. Picture orders are due October 29. Re-takes will be made on October 25. You must have your picture proof with you to have a re-take. Friday is Maroon Out! Students may wear all maroon, except no full-face paint! The school dress code still applies. We hope to see you tonight at the Block Party! 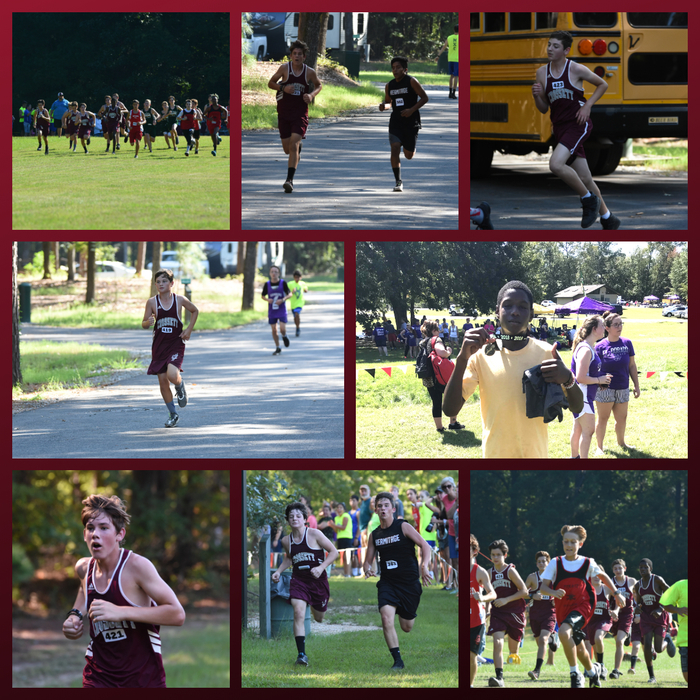 At SAU this past Saturday the Cross Country teams competed. Out of over 100 runners Eric Massenburg finished 6. 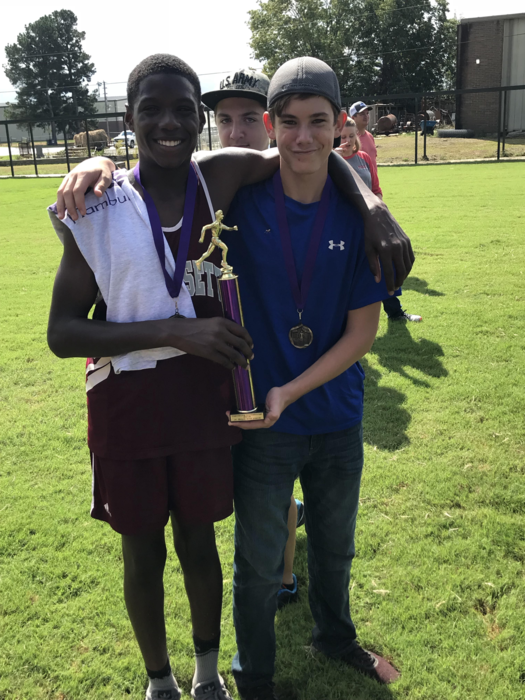 The boys team of Hayden Swan, Massenburg, Clay Meeks, Dylan Pritchard, Max Brooks and J.J Knighton finished 6th place overall. The girls team of Kali Beth Terrell, Lynzee Watt, Abbey Senn, Daley Mcdonald, Lana Townley, Katie Harrington and Selena Cone took home 9th place knocking off 20 other teams. 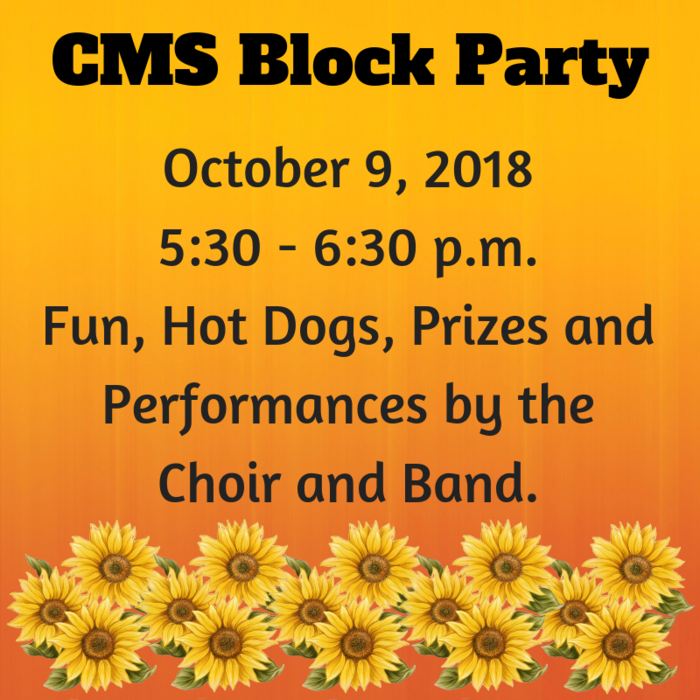 C M S is having a block party on Tuesday, Oct. 9 at 5:30. Weather permitting, we will meet outside, then move to the cafeteria. There will be grilled hotdogs, games, and door prizes. The C M S band and choir will perform. We hope to see you there. 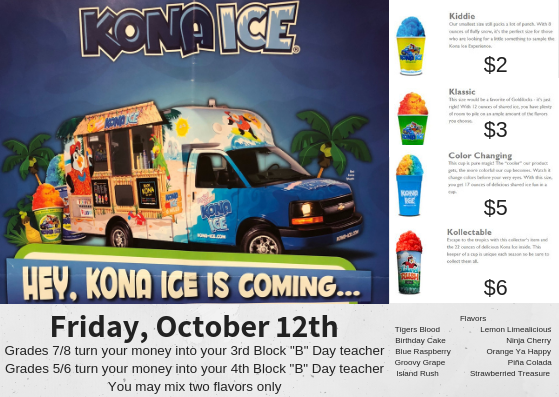 Kona Ice will be here on Friday, October 12th. 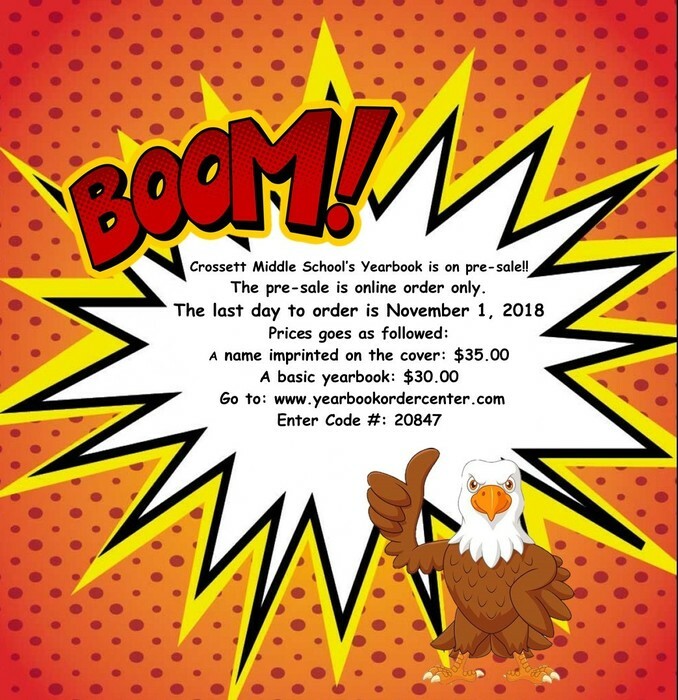 CMS Yearbooks are on Sale! 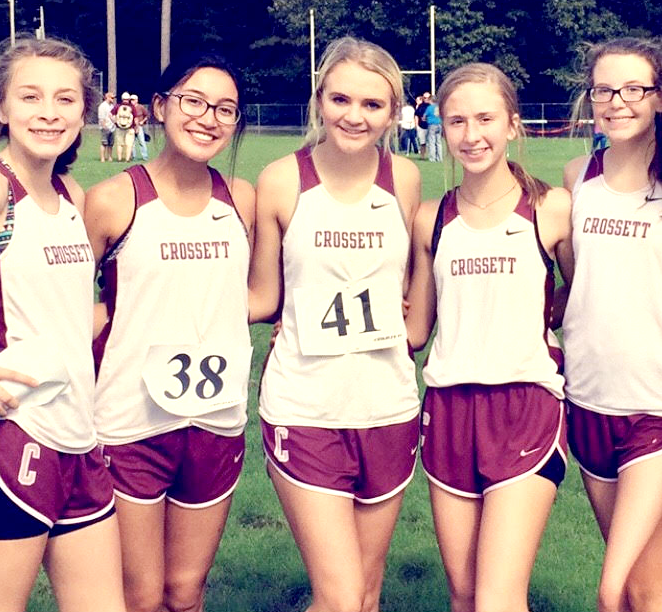 The Cross Country team competed this past Saturday at Hamburg. We had two guys finish in the top 10. Eric Massenburg took 3rd place and J.J. Knighton Finished 10th. The Jr. Boys won 2nd place overall. The girls also competed and all finished in the top 50. 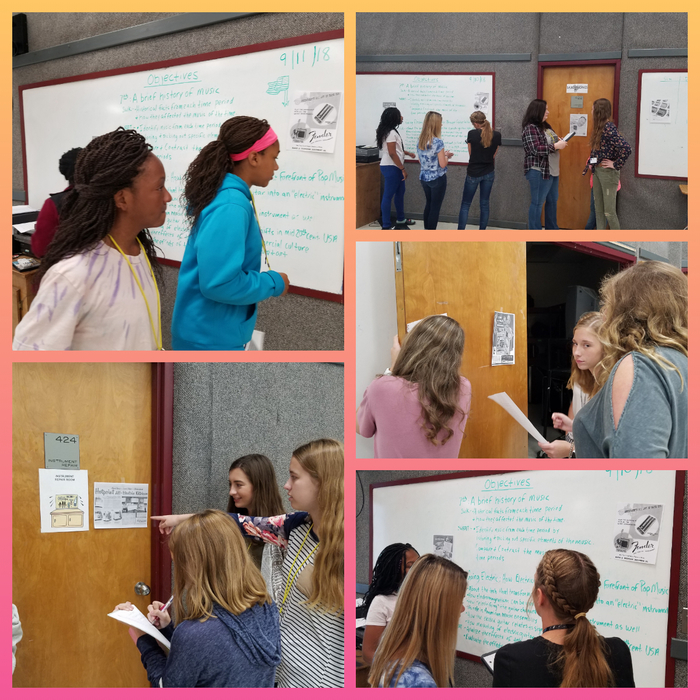 Mr. Waschalk's General Music students participated in a "gallery walk" to learn about how the marketing of the electric guitar fit into the commercial culture of the 1950s. 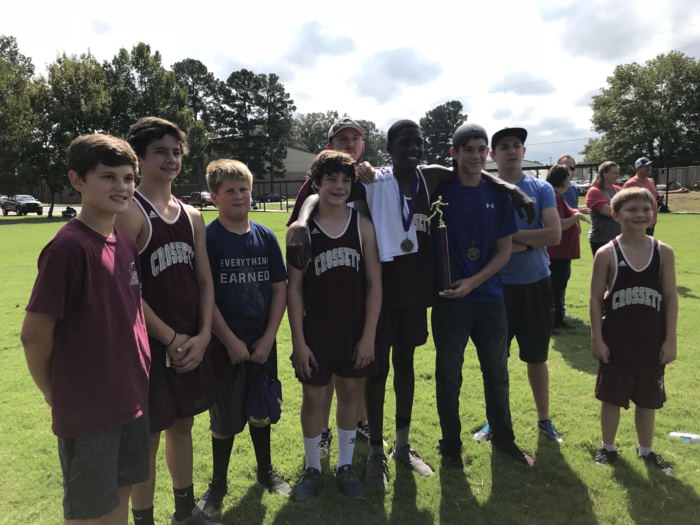 The CMS Cross Country team competed Saturday in a meet at Moro Bay State Park. Congrats to Eric Massenberg for finishing 4th overall. CMS students cheering for the Eagles at the pep rally yesterday. From C M S. If you would like for your child to receive a flu shot at school, please complete the front and back of the permission form that was sent home today. Forms are due back on September 19. Also, Progress Reports will be sent home tomorrow. Thank you. 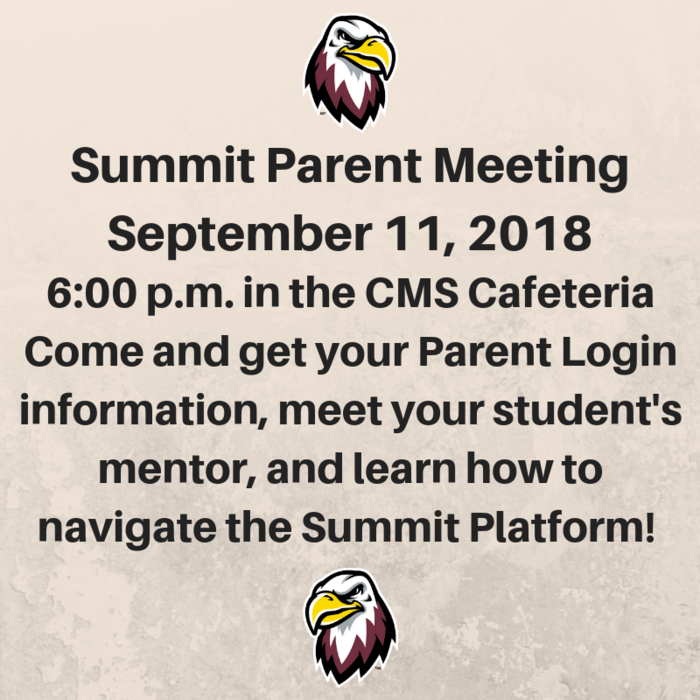 Don't forget the Summit meeting tonight!!! 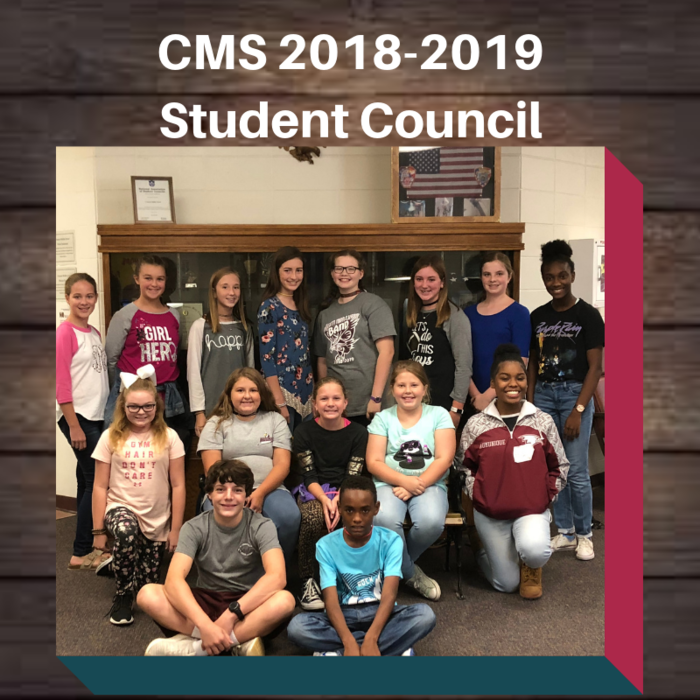 CMS Student Council members for 2018-2019. CMS Picture Day is Tuesday, September 11th!!! There will be a Back to School Dance: 80s Style! So, come dressed in your best 80s attire, pop your collars, roll your jeans and tease your hair and come have a Back to School Blast from the Past! 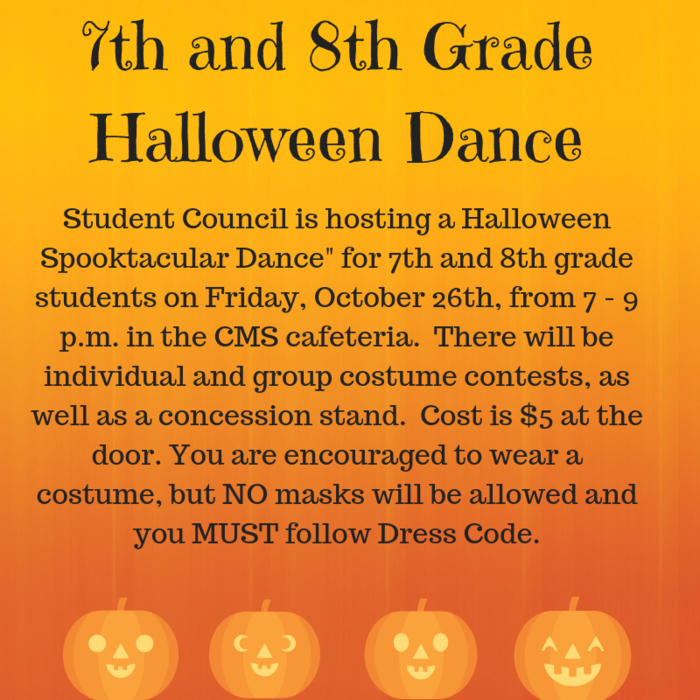 We are doing two separate dances: 5th/6th grade dance will be September 7th from 7:00 pm-9:00 pm and 7th/8th grade dance will be September 14th from 7:00 pm-9:00 pm. The cost is $5 at the door and you MUST have your name tag to get in!! School Dress code still applies! 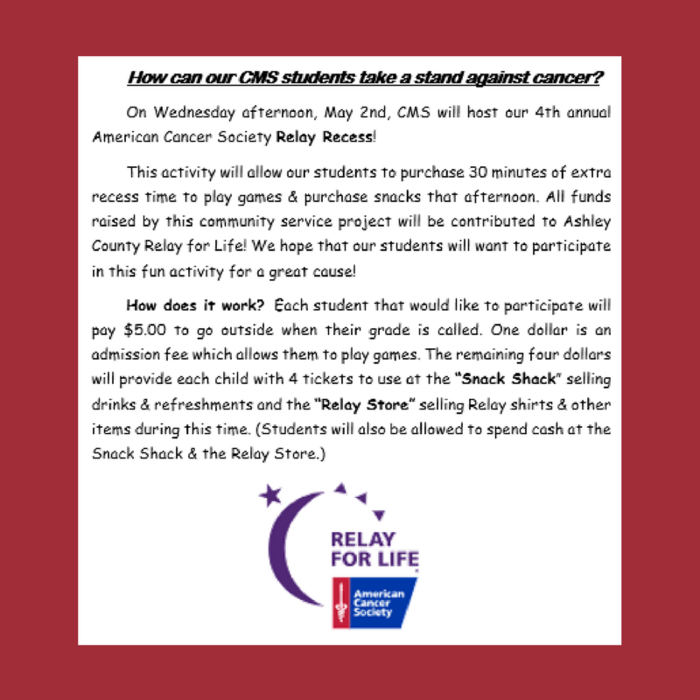 There will be a concession stand as well, so bring extra money for snacks. Please see Ms. Martar for any questions! Change in the beginning date for After School Tutoring... After School Tutoring will begin on September 13, 2018 instead of the announced September 6 start date. We are sorry for any inconvenience. Applications are still being turned in. CMS Beta club is still collecting puppy food. It's not too late to help. 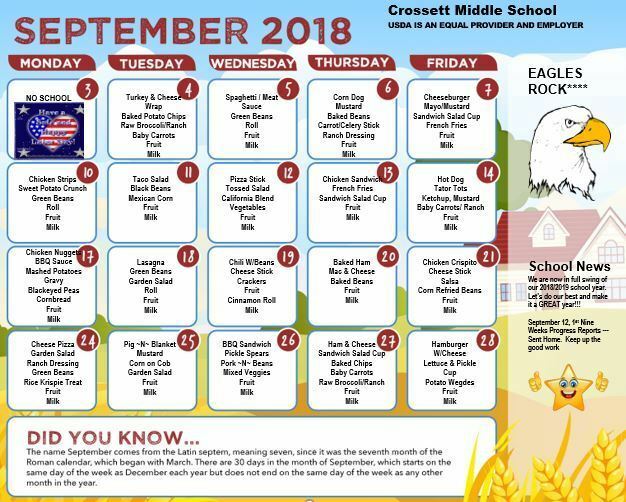 Crossett Middle School would love to have your Box Tops for Education! Let's keep the Leadership classes busy with clipping and counting! We have a collection box in the front office. Thanks for your support! 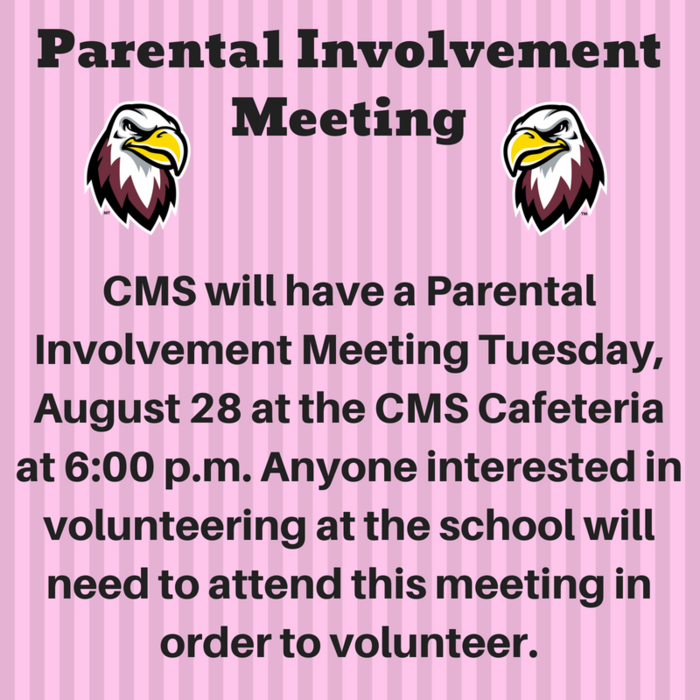 CMS will have a Parent Involvement Meeting Tuesday, August 28 at the CMS Cafeteria at 6:00 p.m. Anyone interested in volunteering at the school will need to attend this meeting in order to volunteer. All power to our buildings has been restored and school will be open tomorrow. Thank you to all those who are working tirelessly to restore power to our community. Wednesday will be a “B” day. We anticipate power being restored in all buildings this evening and we plan to open school at normal hours. If restoration does not occur as planned we will send out notification as soon as possible. Wednesday, will be a "B" day. 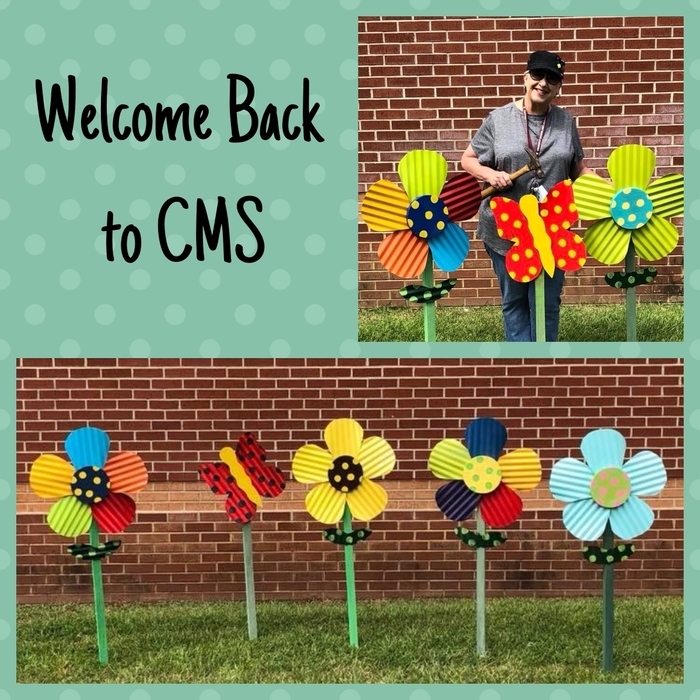 Principal, Lynn Parker, is adding a little cheer to the CMS campus. 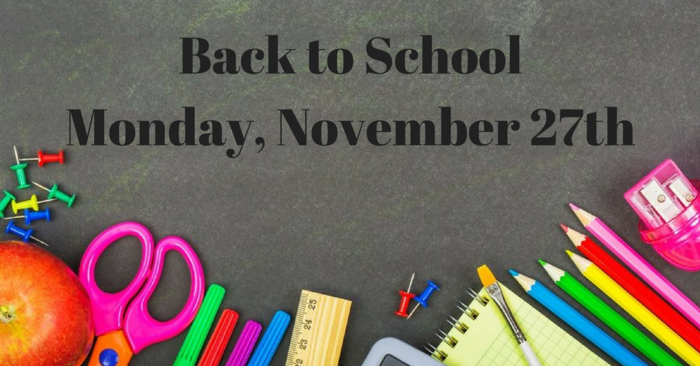 We can’t wait to see our students Monday morning! Looking forward to a GREAT year! CMS students will have the option to order a salad this year. CMS Parent involvement had a drawing last night at the 7-8 Summit Learning meeting for a $10 gift card to Big Daddy’s. Suzanne Cedotal was the winner of the gift card. Congratulations!!! Grant Collins, 5th grade science teacher, builds complex machines (pulley+wheel and axel) to rescue a trapped tiger. He is attending Project Lead the Way Launch Classroom Teacher training at Arkansas Tech. 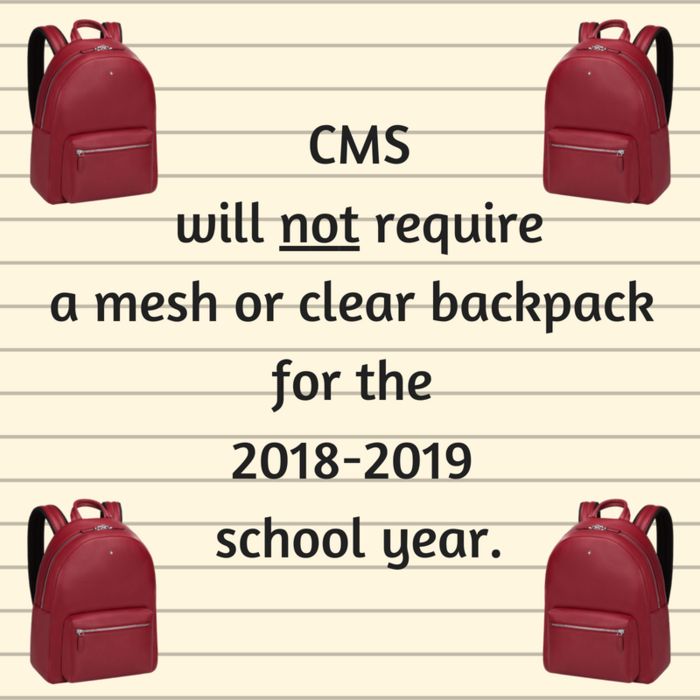 Backpacks for 2018-2019 school year. 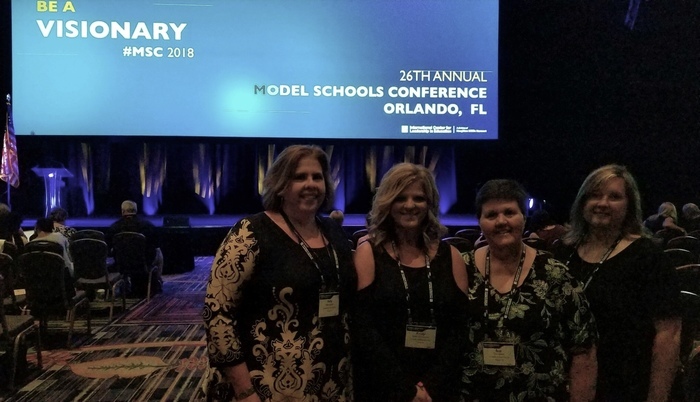 Kelly Spradlin, Kristy Stephenson, Sue Gibson, and Brandi Culp from CMS are attending the Model Schools Conference in Orlando this week. 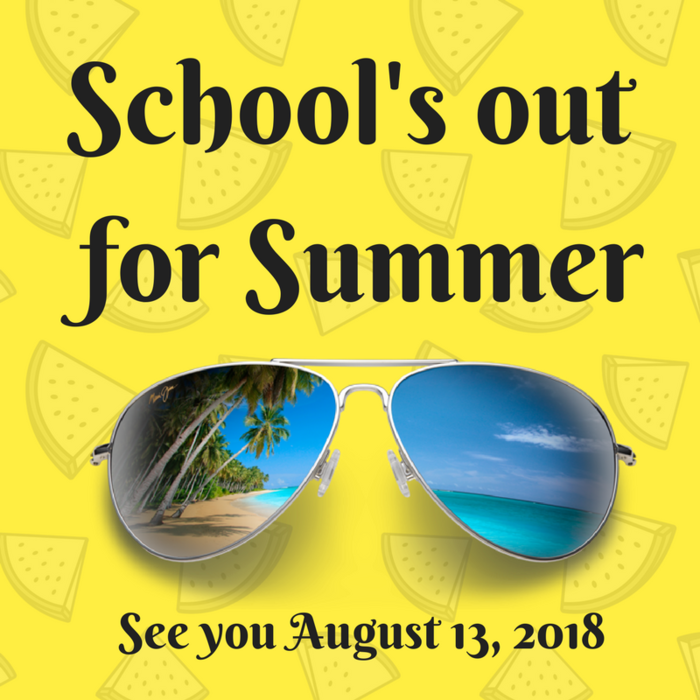 Have a safe and fun summer and we will see you again on August 13th for the first day of school!!! 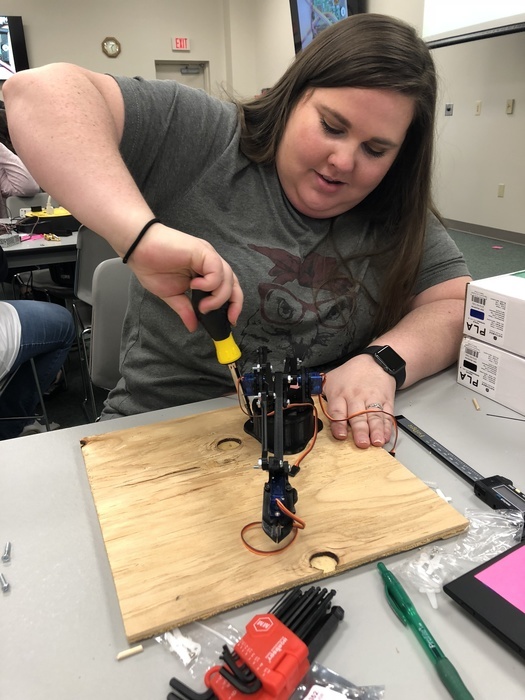 The CMS Robotics team will host a Science and Technology Summer Camp June 18-22. 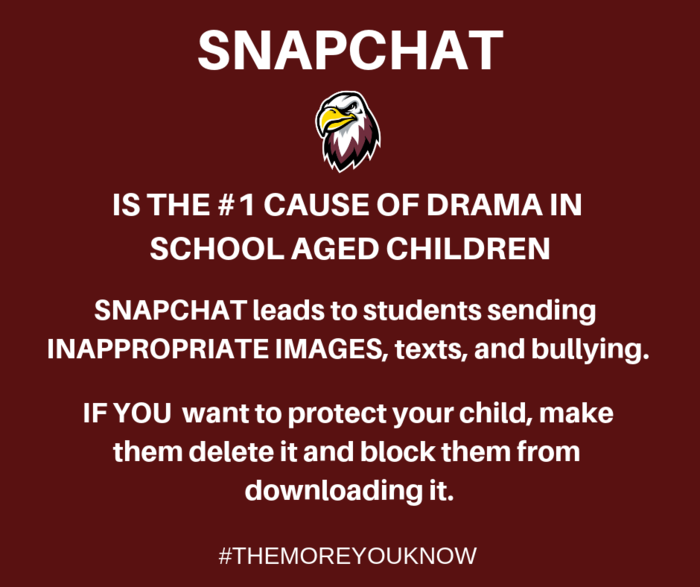 For more information, call the office at your child's school. Registration has been extended until June. 4. 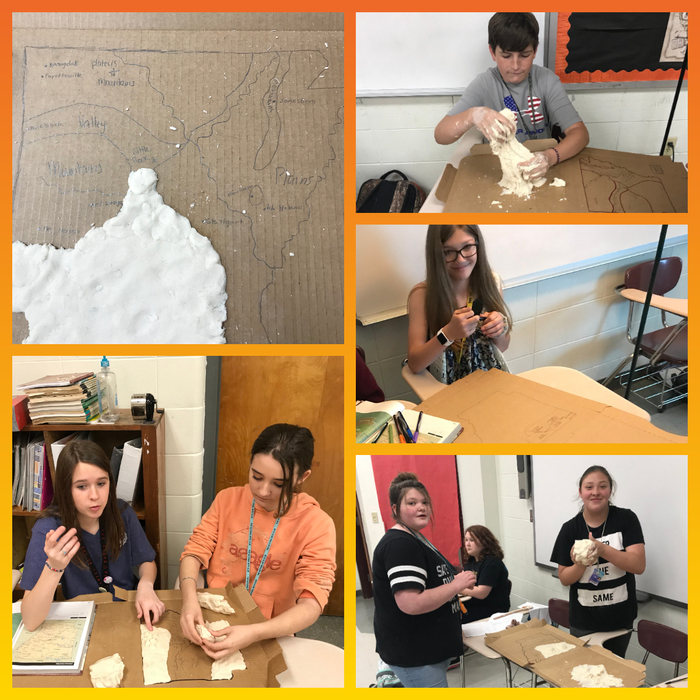 For their final project in Arkansas History students created a topographic map of the state using homemade clay. By doing this students were able to get a visual of the terrain features of our state. Many were surprised to see that all of the state isn’t flat. 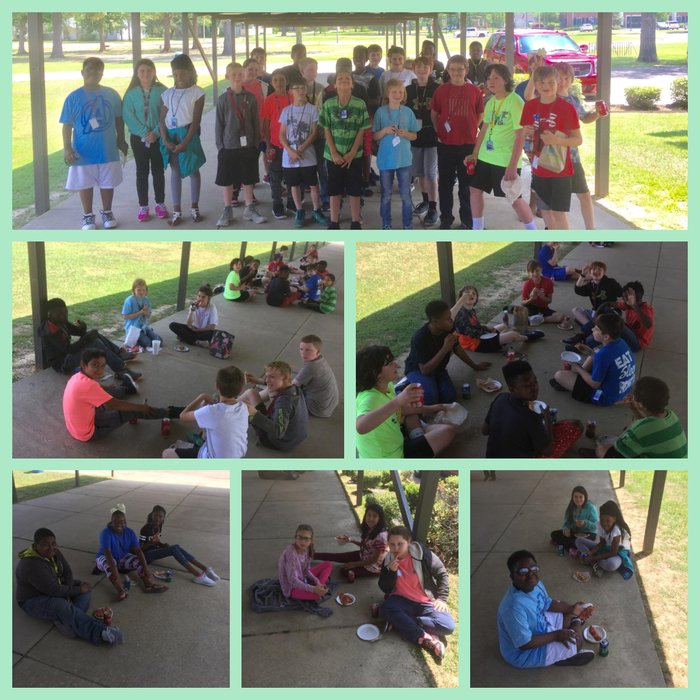 5/6 grade students enjoyed pizza for lunch. Congratulations to these students for increasing their reading scores in Mrs. Lynn Rice's room. Great job! 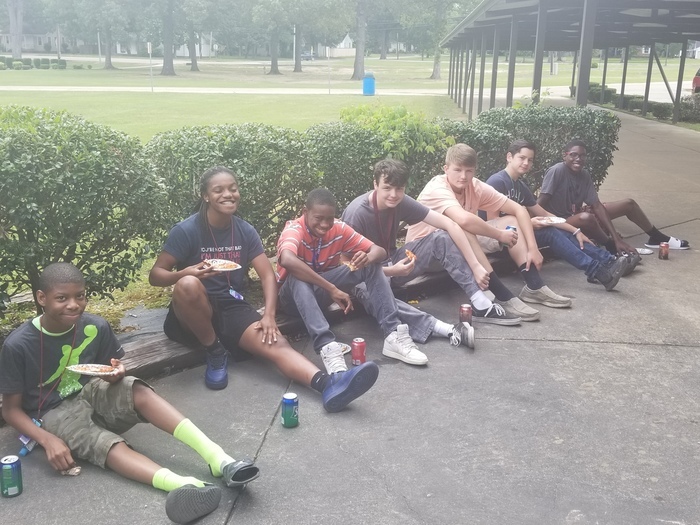 7/8 grade students enjoyed pizza for lunch today. Congratulations to these students for increasing their reading scores in Mrs. Lynn Rice's room. Great job! 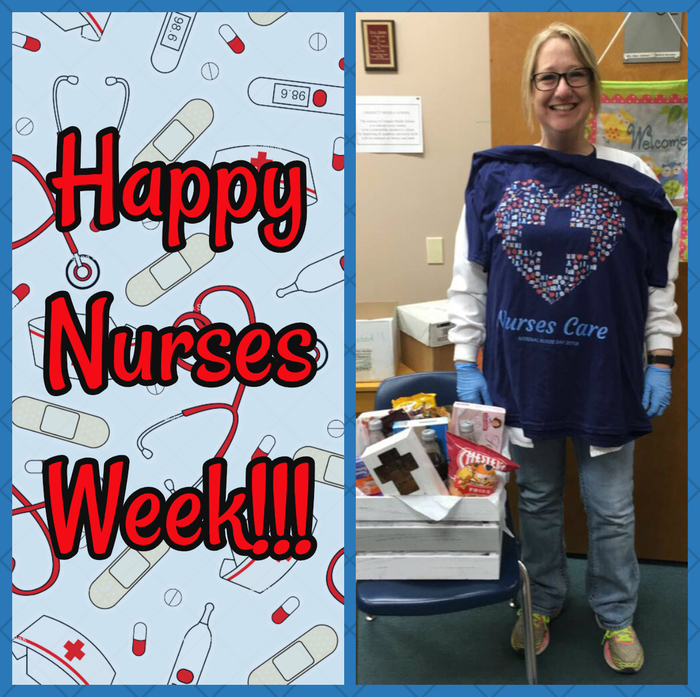 Congratulations to Belinda Neel for winning the prize in the Friday drawing for Teacher Appreciation Week!!! 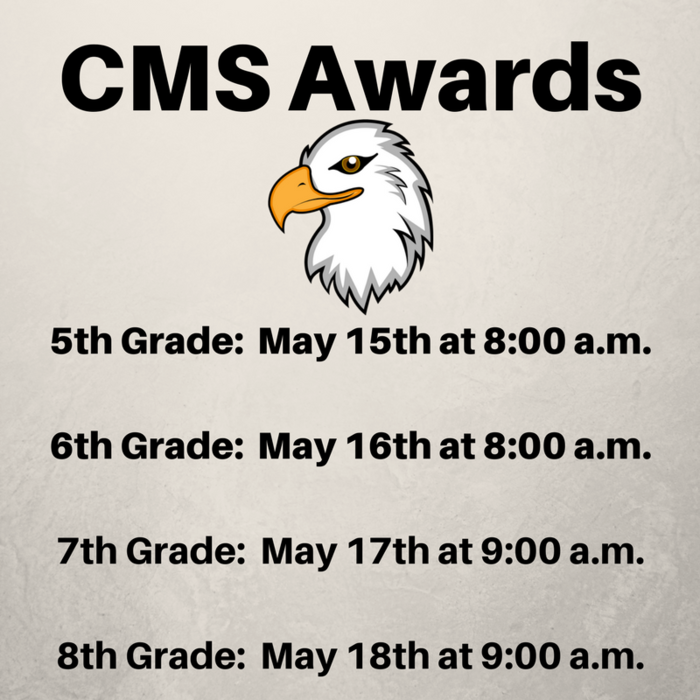 CMS awards assembly will be this week in the cafeteria. During advisory, 5th grade on Tuesday and 6th grade on Wednesday. During 1st block, 7th Grade on Thursday and 8th Grade on Friday. 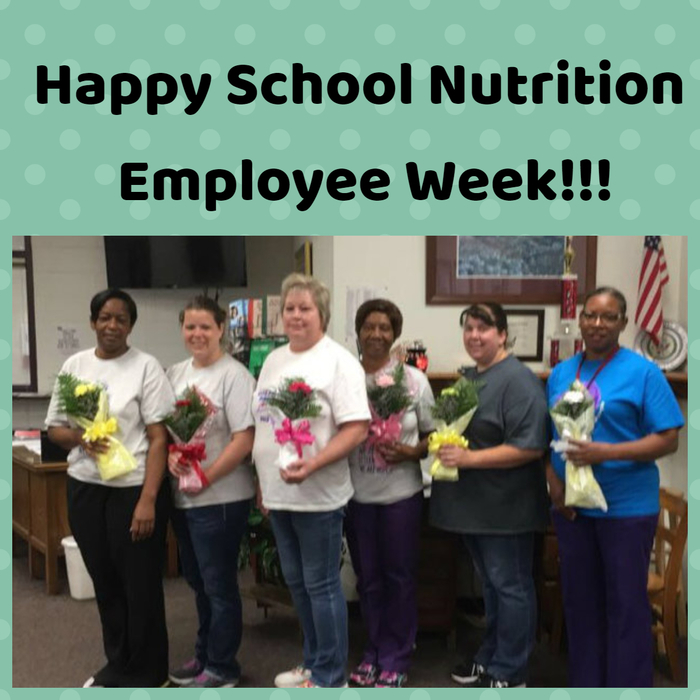 Happy School Nutrition Employee Week!!! 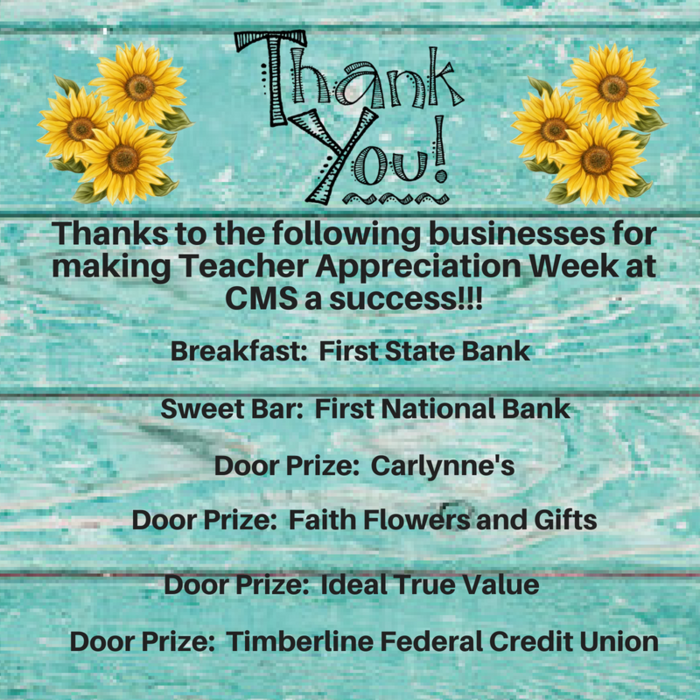 Special Thanks to local businesses for Teacher Appreciation Week. 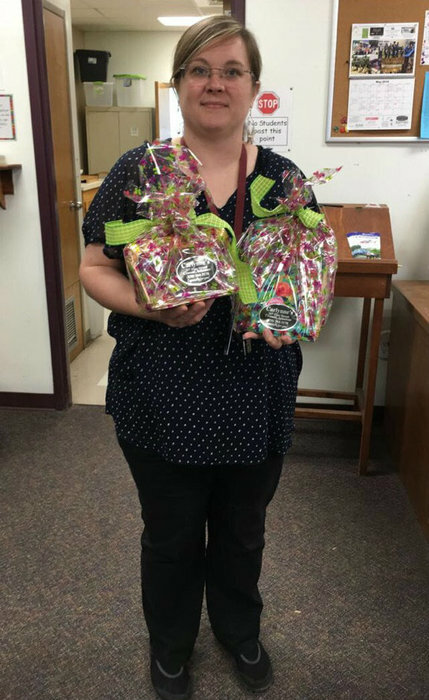 Congratulations to Brandi Culp for winning the prize in the Thursday drawing for Teacher Appreciation Week!!! The CMS Eagle Sounds Choir ended their performance season with a magnificent rendition of the Star-Spangled Banner Tuesday night @ Dickey-Stephen's Stadium in North Little Rock, AR. The choir was given great compliments from players and park officials! 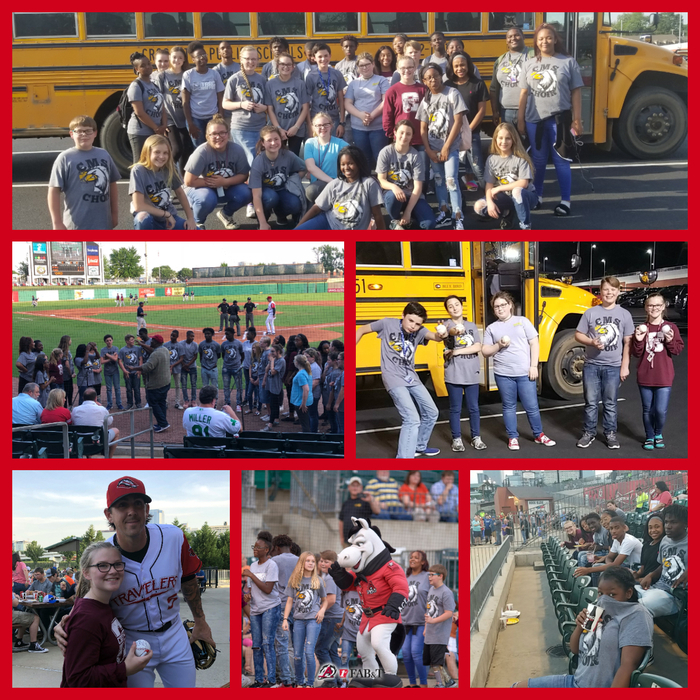 Students also enjoyed watching the Travelers play the Naturals and several students caught foul balls from their seats near first base! It was a great night all around! 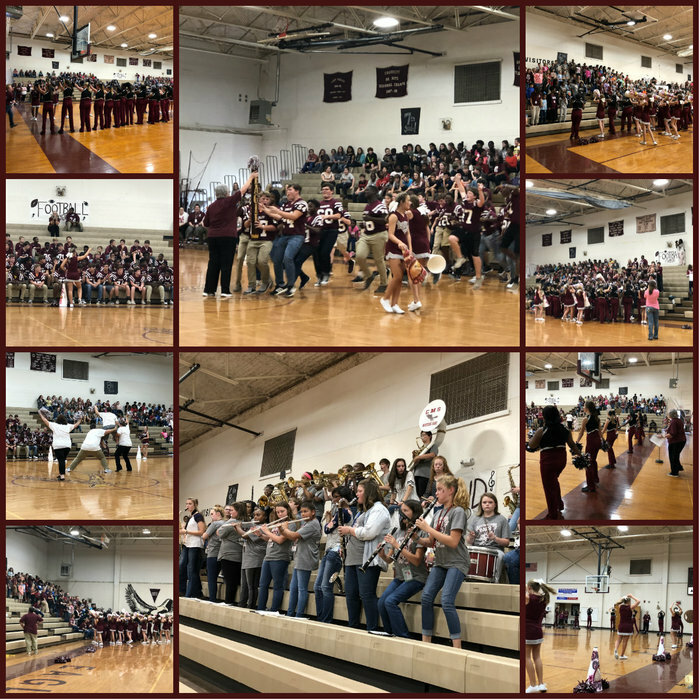 Mr. Murdock would like to extend a huge thank you to the community of Crossett that continues to support the CMS Choral program as it takes on performance after performance! Thank you so much for supporting the arts and our students! 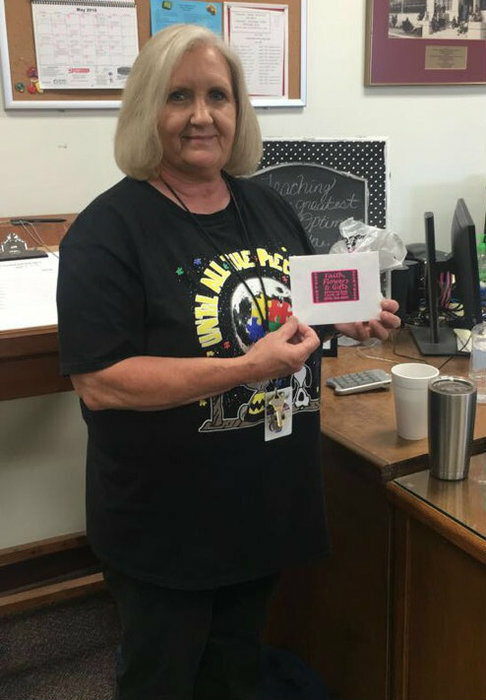 Congratulations to Brenda Stroud for winning the prize in the Wednesday drawing for Teacher Appreciation Week!!!. The CMS Robotics team will host a Science and Technology Summer Camp June 18 -22. 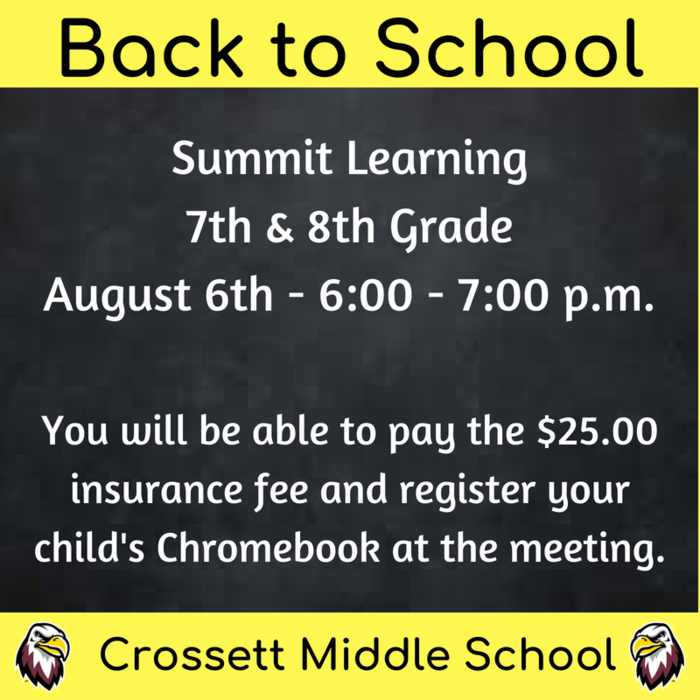 For more details and registration information, call the office at your childs school. Registration ends May 25th. 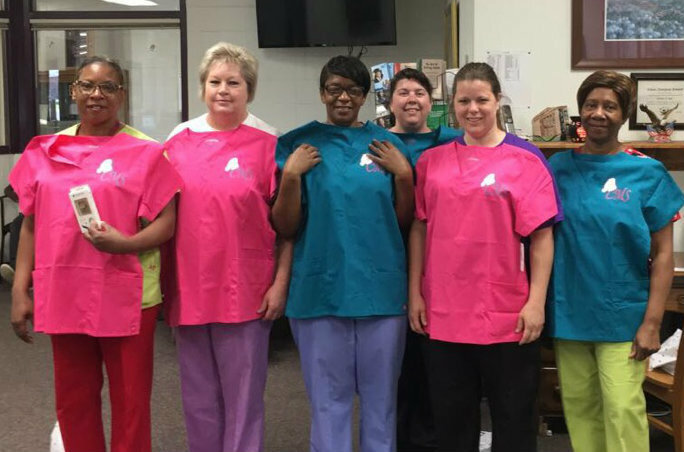 Cafeteria ladies received special scrub tops in celebration of School Nutrition Employee Week. 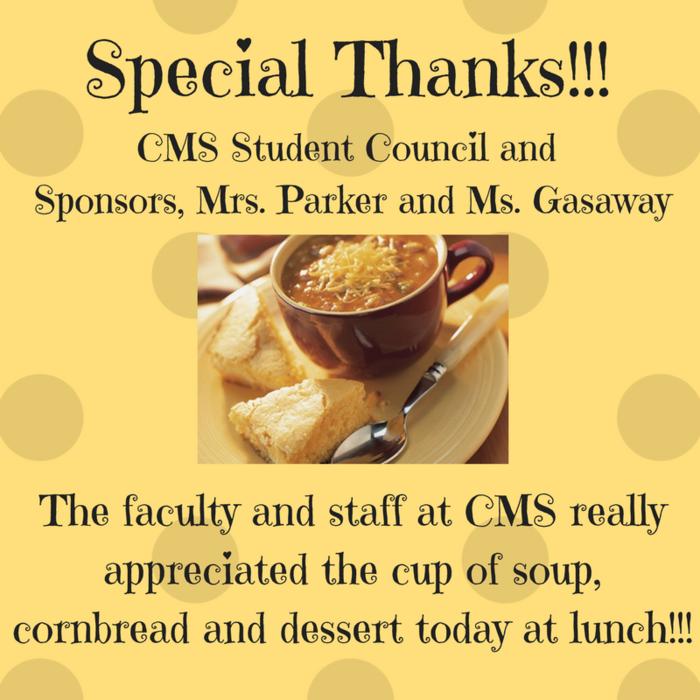 Thanks for all of the wonderful meals you prepare each and every day at CMS. 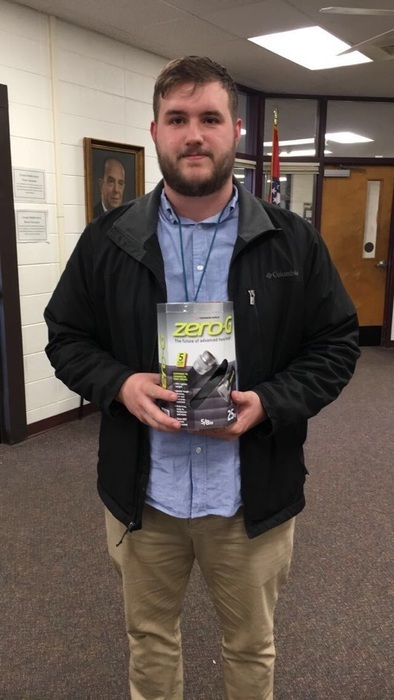 Congratulations to John Knight for winning the prize in the Tuesday drawing for Teacher Appreciation Week!!!. Kona Ice will be here Friday, May 11th. 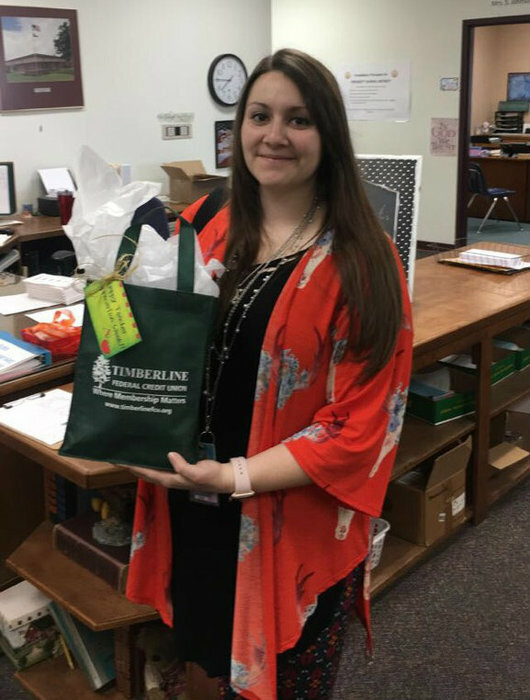 Congratulations to Andrea Canady for winning the prize in the Monday drawing for Teacher Appreciation Week!!!. 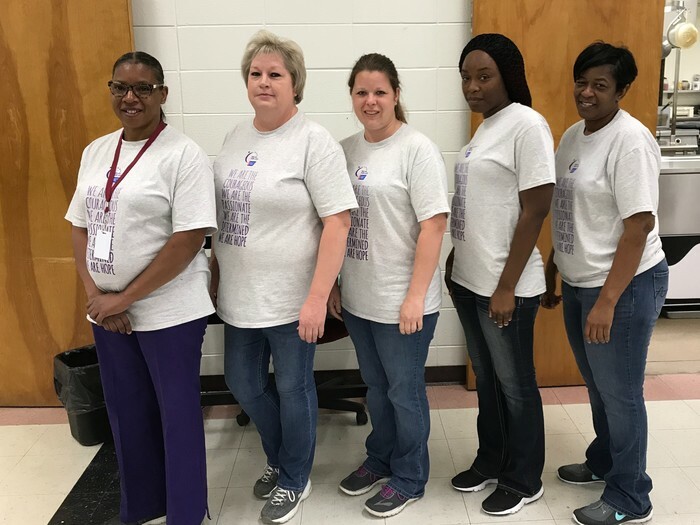 Crossett Middle School cafeteria staff shows their support for Relay for Life! Teachers change the lives of millions of children every day, and their work extends far beyond the classroom. 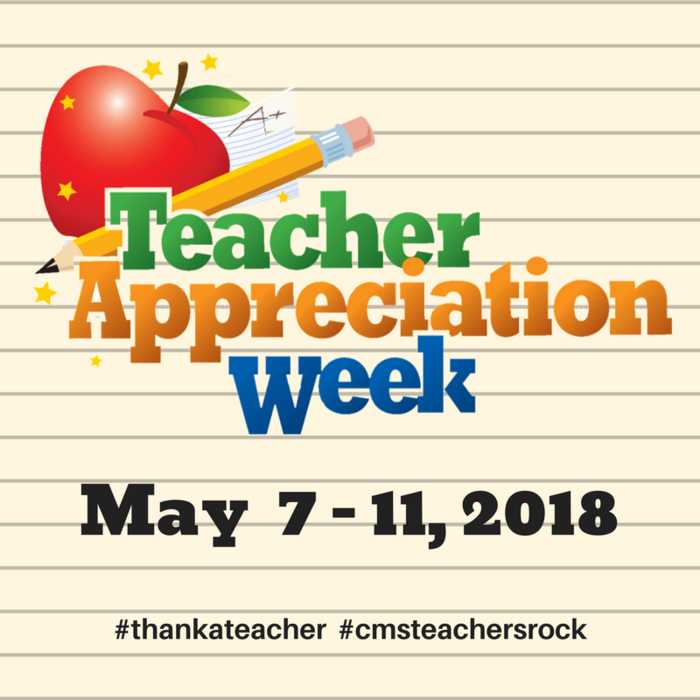 Take some time this upcoming week to Thank a Teacher at CMS. 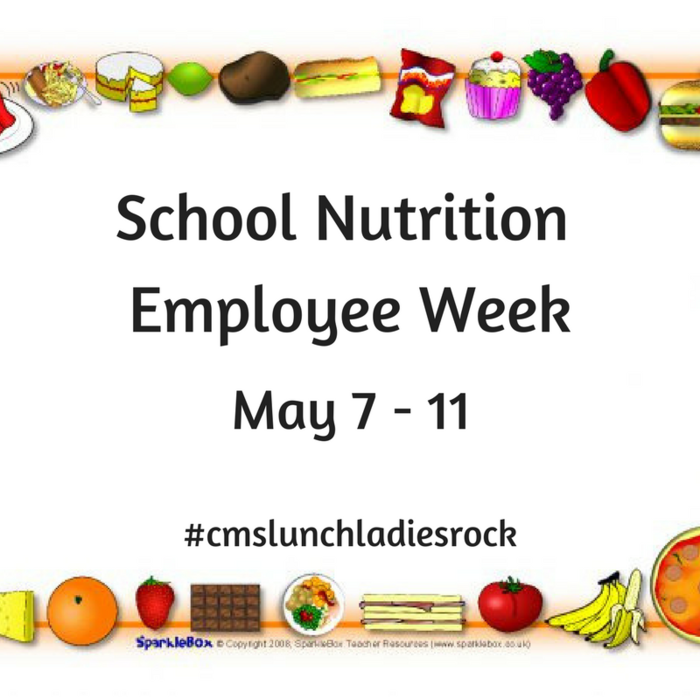 School Nutrition Week is May 7 - 11, 2018. 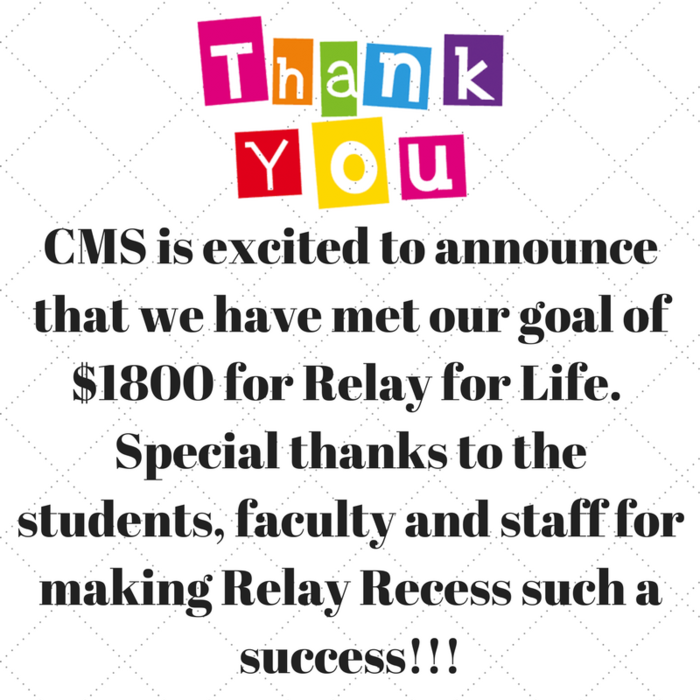 CMS Relay Recess raises $1800 for Relay for Life. 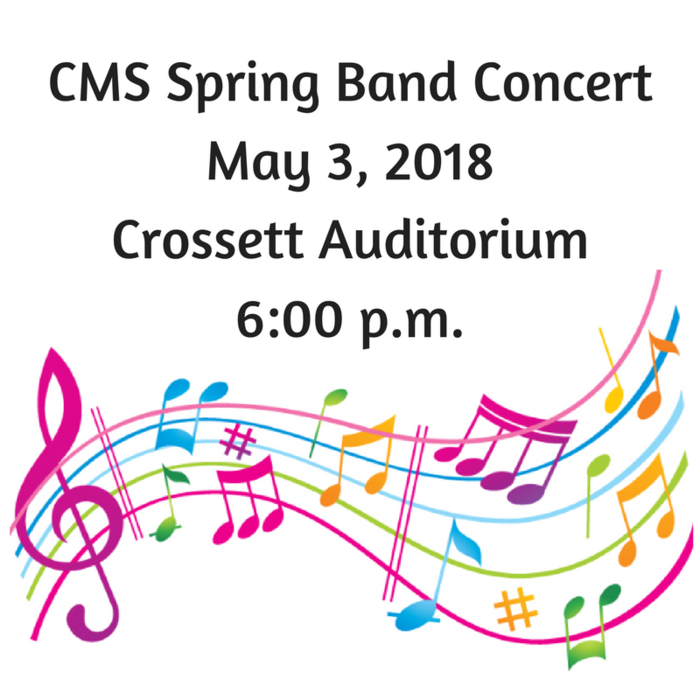 CMS Spring Band concert will be held Thursday, May 3rd at 6:00 in the Auditorium. 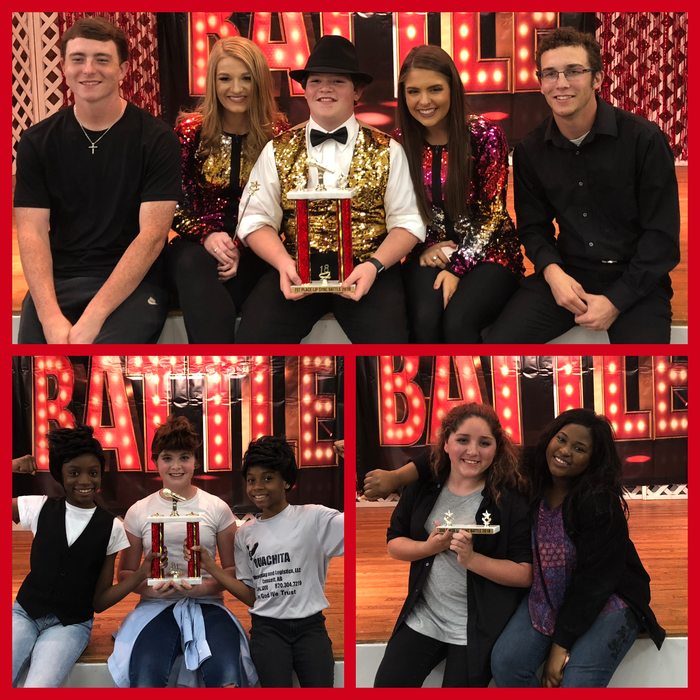 CMS Beta club hosted their 2nd annual lip sync battle fundraiser last Saturday. 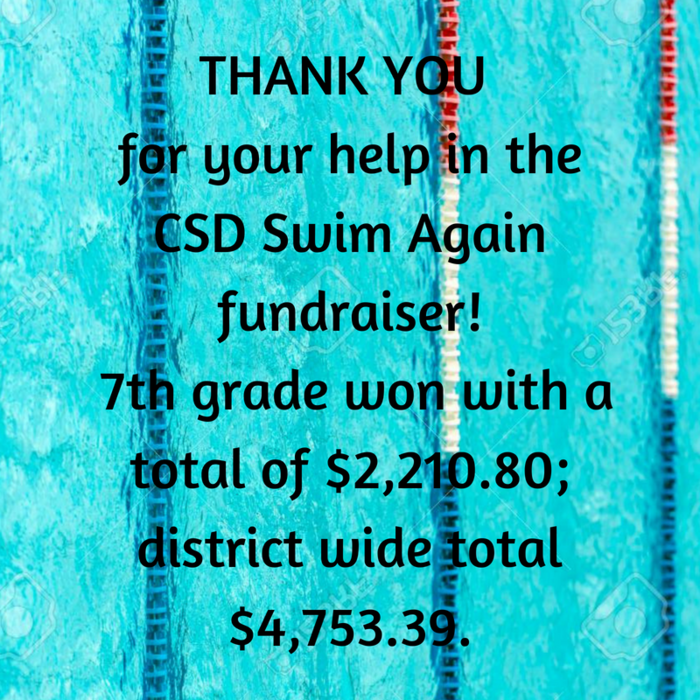 They would like to thank everyone who participated and attended to help make this possible! 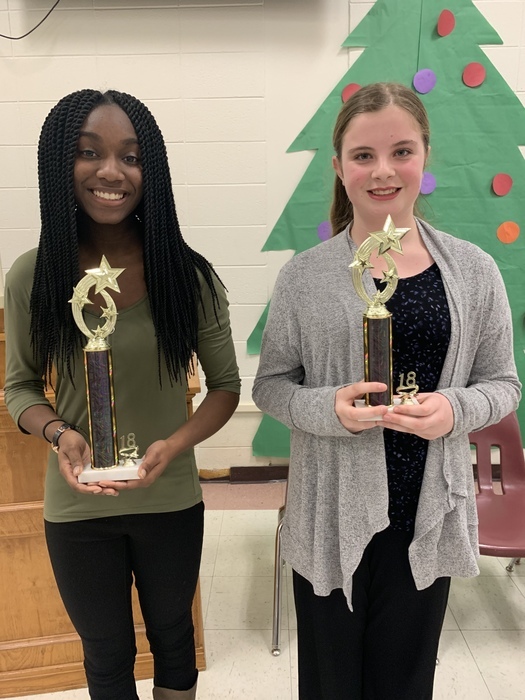 The winners were: First Place – Cole Gill, Second Place – Tressa Richards, Samiyah Phillips, and Makailynn Byrd and Third Place – Lexi Meeks and Morgan Wade. CMS students enjoy snow cones from Kona Ice and some extra time outside after completing ACT Aspire testing. 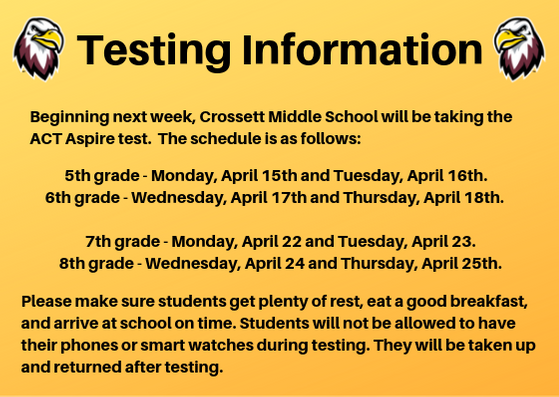 Congratulations to our CMS students for working really hard and being prepared each day for the ACT Aspire!! These students won a Kindle Fire and Case in a grand drawing for receiving all of their tickets during their testing period. 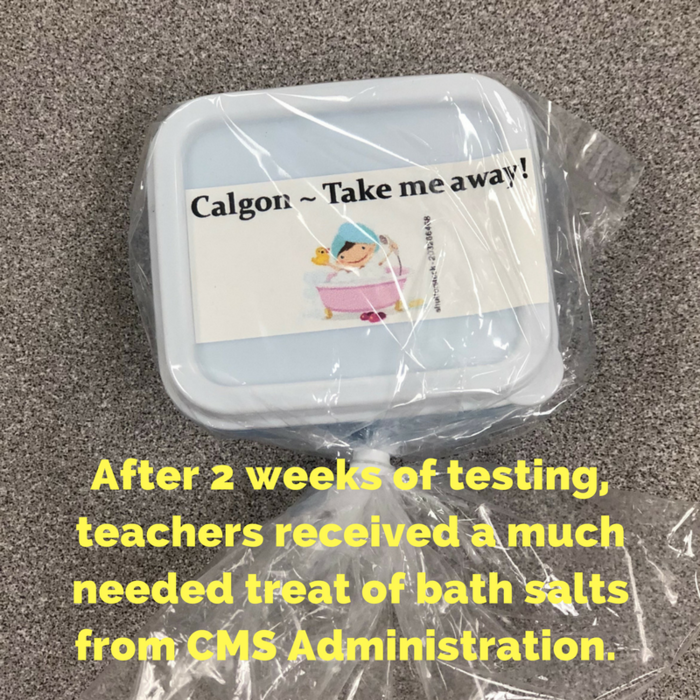 CMS faculty and staff receive a special treat!! Kona Ice will be at CMS on Friday, April 27th. 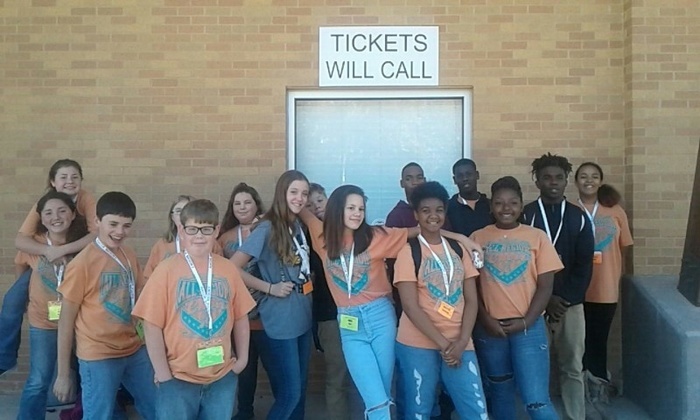 CMS FBLA members competed at the FBLA District III Spring Leadership Conference in Pine Bluff today. Placing in their events were Colin Martin – 1st Place in Proofreading, Daley McDonald – 2nd Place in One Minute Timed Writing, Kameron Williams – 3rd Place in Career Exploration, Emma Burt – 3rd Place in Public Speaking, and Kristin Parks – 5th Place in Creed. Congratulations!!!! 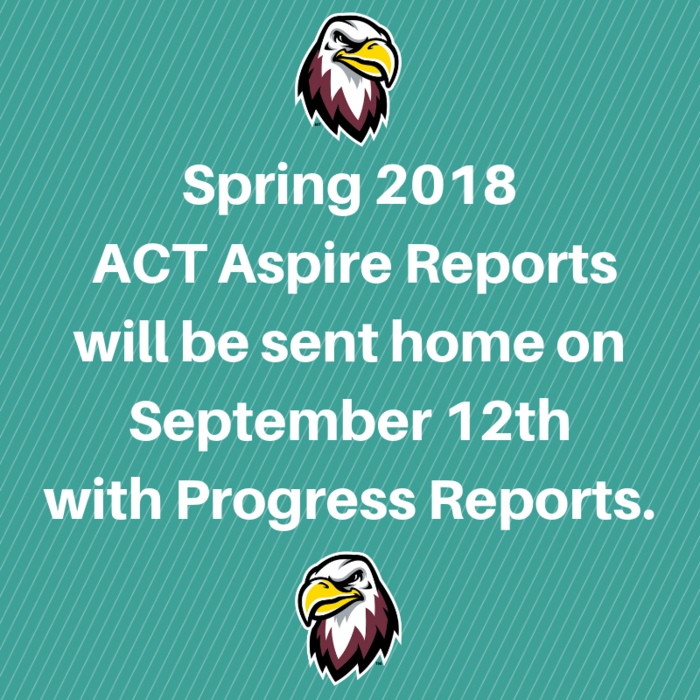 Progress Reports will be sent home with students on Wednesday. 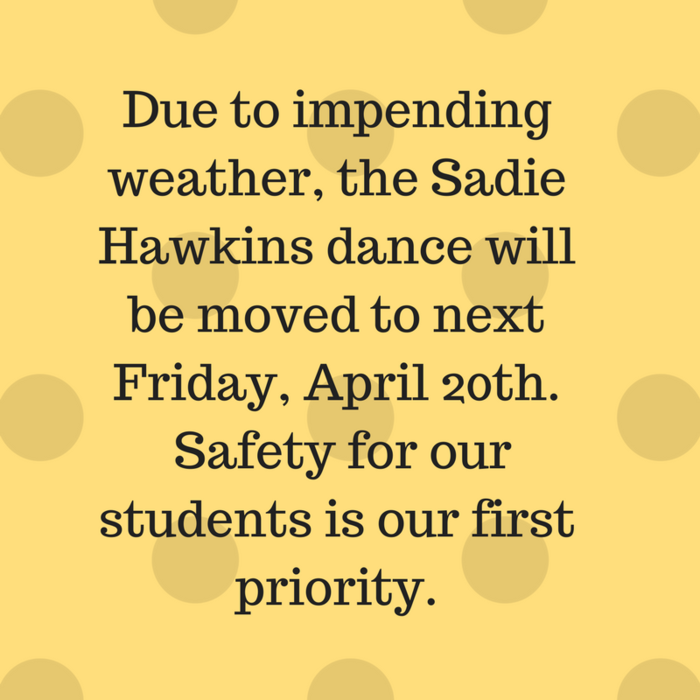 Sadie Hawkins dance has been postponed to April 20th. 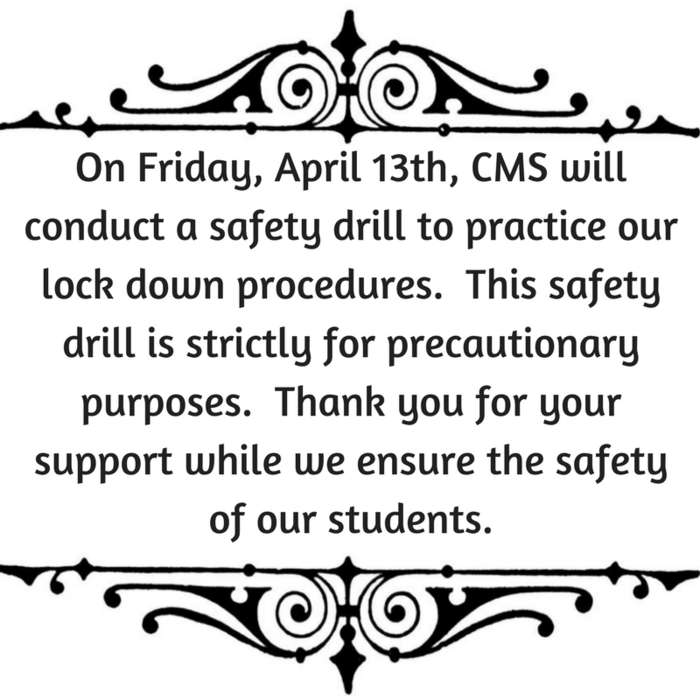 On Friday, CMS will conduct a safety drill to practice our lock down procedures. This safety drill is strictly for precautionary purposes. Thank you for your support. Safety is our priority. Mrs. Todd's PLTW Robotics group has won their first match and will be competing again at 12:15 (Q64). You can hopefully watch the match at http://create-found.org/Webcast.php. Congrats! 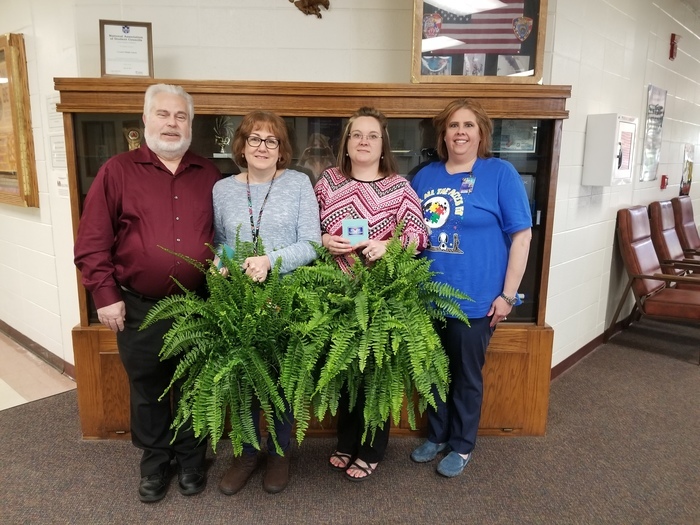 Congratulations to Brandi Culp, CMS Teacher of the Year and Stacy Johnson, CMS Classified Employee of the Year!!! 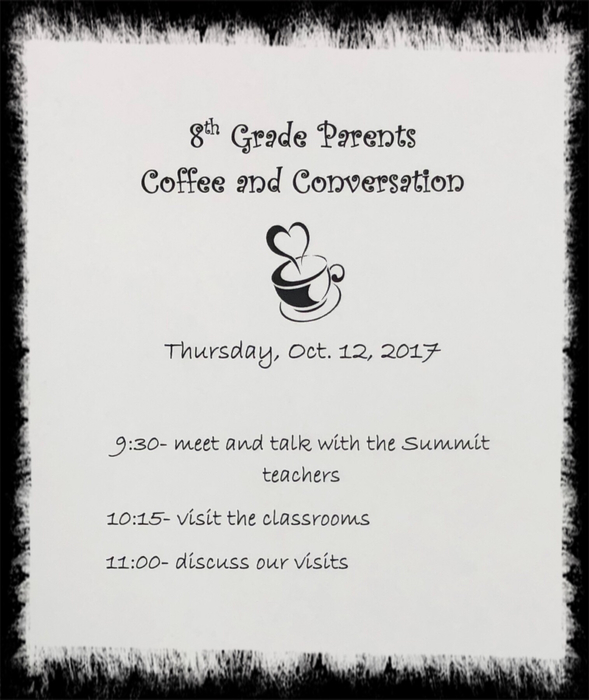 Don't forget about Coffee and Conversations today at 9:30 am. It's time for the 2nd annual spring musical! The CMS Choir Department with the help of the CMS Art Department are presenting Madagascar Jr: A Musical Adventure! This production will be during 4th block in the Auditorium. The 5/6 show will be April 4 and the 7/8 show will be April 5. Student tickets will go on sale Thursday, March 15 in their 4th block class. Tickets are $4. Our public performance dates are Friday, April 6 @6 pm and Saturday, April 7 @11 am. Adult tickets are $7 Children $2 (children under 5 enter for free). *Public tickets can be purchased at the door* Please come out experience this hilarious and catchy show! 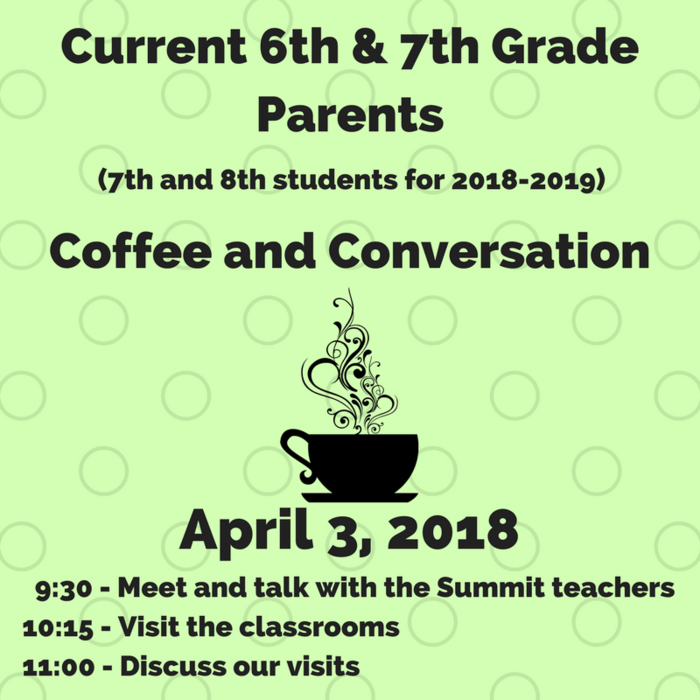 Don't forget about Coffee and Conversation tomorrow April 3rd at 9:30 am. 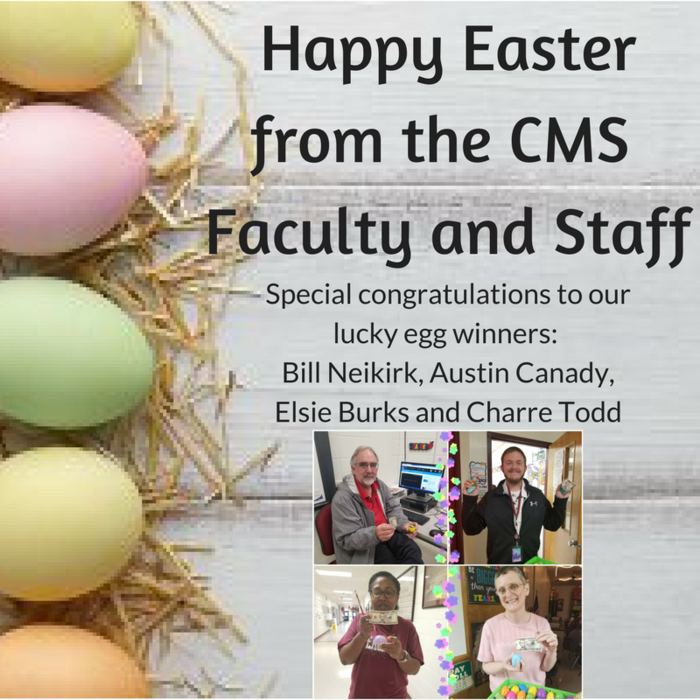 Happy Easter from the CMS Faculty and Staff! Wednesday, April 4, is Spring Picture Day. This is a pre-paid basis only. Order forms will be sent home on Monday, April 2nd. We wanted to remind you that Report Cards were sent home today with your student. School will be dismissed on Friday, March 30th for Good Friday. Third nine weeks report cards will be sent home today. Just a reminder that Monday, March 26th will be an “A” Day!! See you in the morning!!! 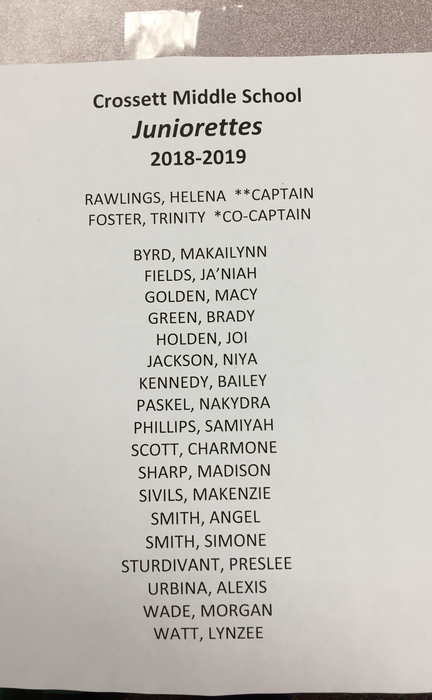 Congratulations to the 2018-19 CMS Juniorettes!!! CMS Parents if your child has qualified to attend a reward day, they should have brought a letter home yesterday or today. If you have any questions, please call the school. 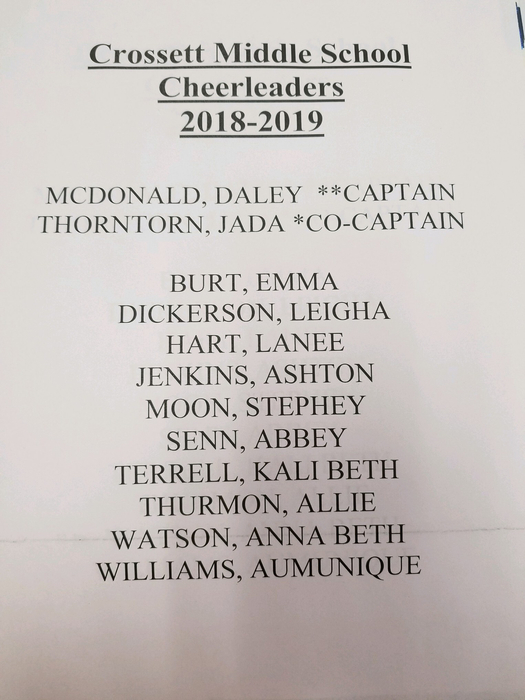 Congratulations to the 2018-19 CMS Cheerleaders!!! 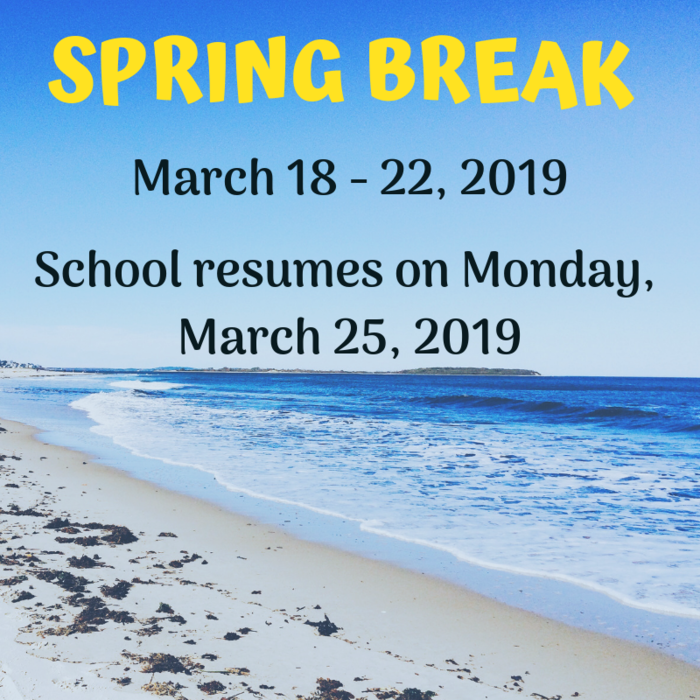 Spring Break is March 19-23, 2018. Last day to order Yearbooks is April 1st. Order forms are in the office. Juniorette tryouts will be held Friday, March 9th. Any student that is trying out for Juniorette will not be allowed to sign-out and leave on the day of tryouts. Good luck to the girls trying out for CMS Cheerleader today!! If we return to school tomorrow it will be an A day. If we return to school on Monday it will be a B day. Keep checking the website and Facebook page for updates. If school is canceled, the link for our AMI (Alternate Method of Instruction) will be on Facebook and school web page. Students without internet access will be allowed to make up work at school. After school tutoring has been cancelled this afternoon. School will be in session February 19, 2018. We were schedule to be dismissed for President's Day, but it has been rescheduled as a makeup snow day. See you tomorrow morning! 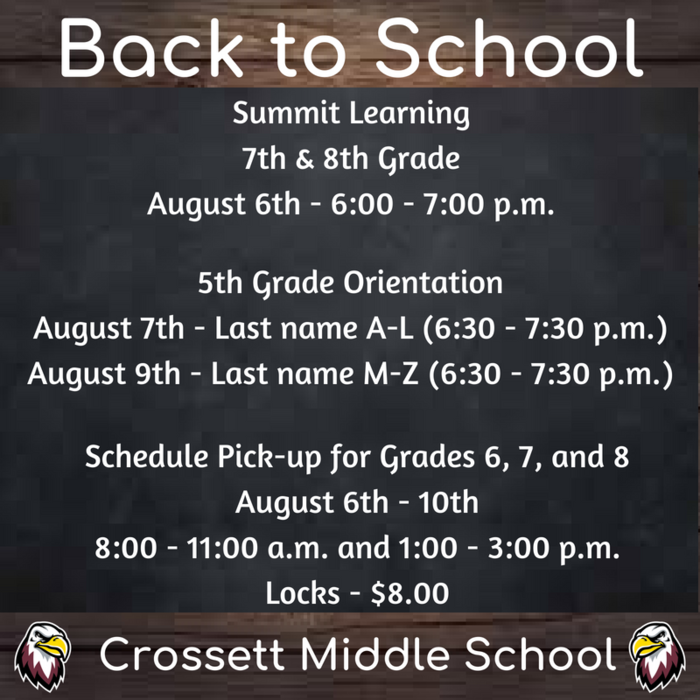 Summit Learning information for 2018-2019. 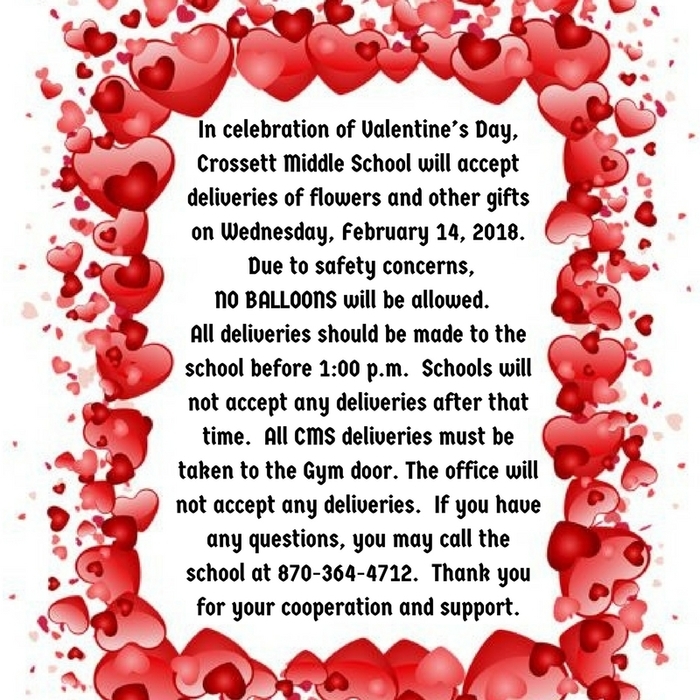 Crossett Middle School will accept Valentine deliveries from 8:00 until 1:00. No deliveries after 1:00. Please use the gym door for deliveries. Balloons will not be allowed.Thank you. 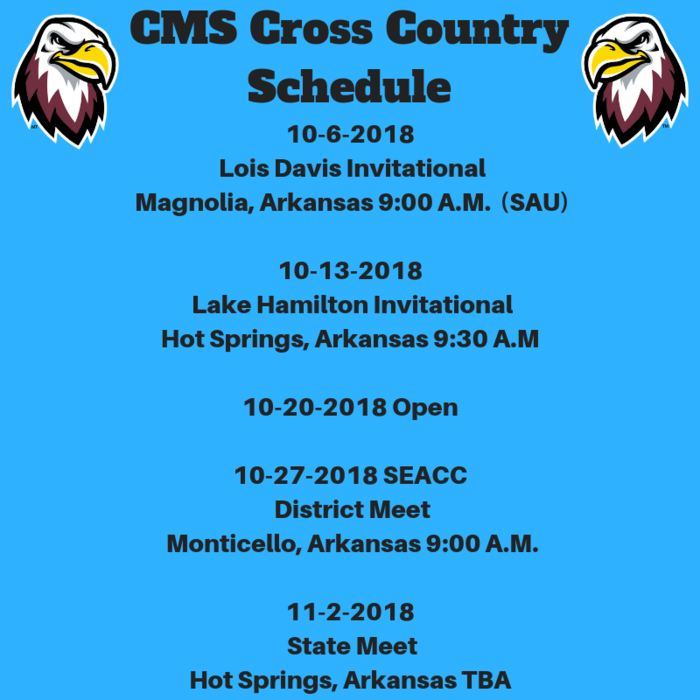 CMS Juniorette Tryouts will be held on March 9 at Crossett Middle School. Sign-up sheets and tryout information are in the office. If you are interested in trying out for Juniorette, you MUST sign up BEFORE 1:00 p.m. Monday, February 19th. You will not be allowed to sign up after this date and time, and you will not be allowed to tryout if you don’t sign up. 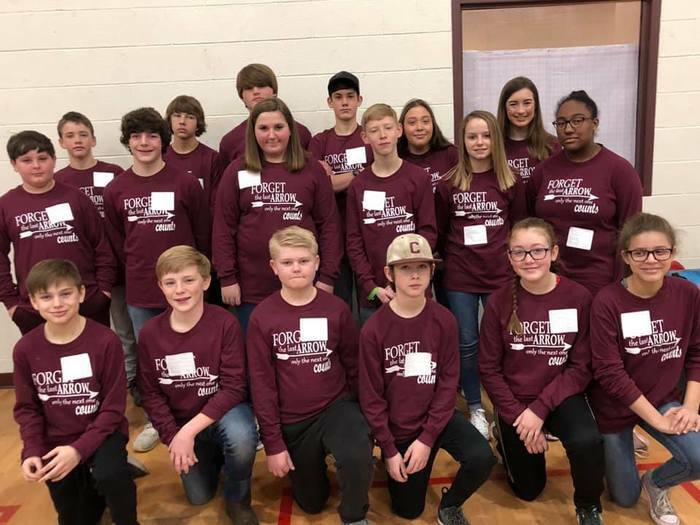 Good luck to the CMS Archery team as they compete in the Regional competition at Hamburg tomorrow!!! Information about Valentines Day deliveries are in the flyer. 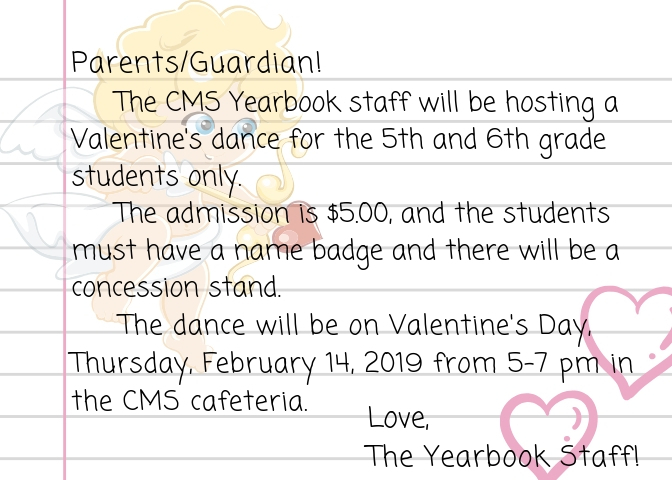 CMS Yearbook will be hosting a Valentine's Day Dance for 5th and 6th grade on Friday, February 16th. The admission is $5.00 at the door. The doors open at 6 pm and the dance will end at 8 pm. The attire is casual or dressy casual. There will be a photo booth and concession stand. Students will need their name badges and to follow the dress code. The 6-10th grade GT meeting about Washington, DC/New York will meet in the library, not the cafeteria at 6:00 pm tonight. Don't forget to place your Spirit and Pride order by tomorrow, February 6, 2018. Babe Ruth Sign-ups will be February 3rd, February 10th and February 17th at the Sports Complex from 8:00 am to 12:00 pm. No School for Students Monday, February 5 due to Parent Teacher Conferences. Parent Teacher Conferences will be held from 12:00 noon to 6:00 pm. CMS Cheerleader Tryouts will be held on March 2 at Crossett Middle School. Sign-up sheets and tryout information are in the office. If you are interested in trying out for cheerleader, you MUST sign up BEFORE Thursday, February 8. You will not be allowed to sign up after this date, and you will not be allowed to tryout if you don’t sign up. 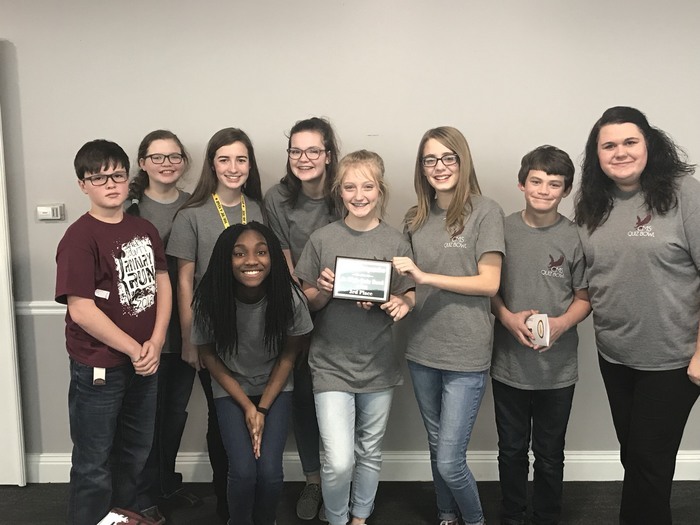 The 7th and 8th grade Quiz Bowl team placed 3rd overall in the SEARK Cooperative Quiz Bowl competition today. There were 13 schools from Southeast Arkansas who competed. Mary Kathryn Staley was our scorekeeper. Madison Sharp, Trinity Foster, Drew Johnson, Sam Wright, Michael Atchison, Leigha Dickerson, and Brooklynn Bailey competed. 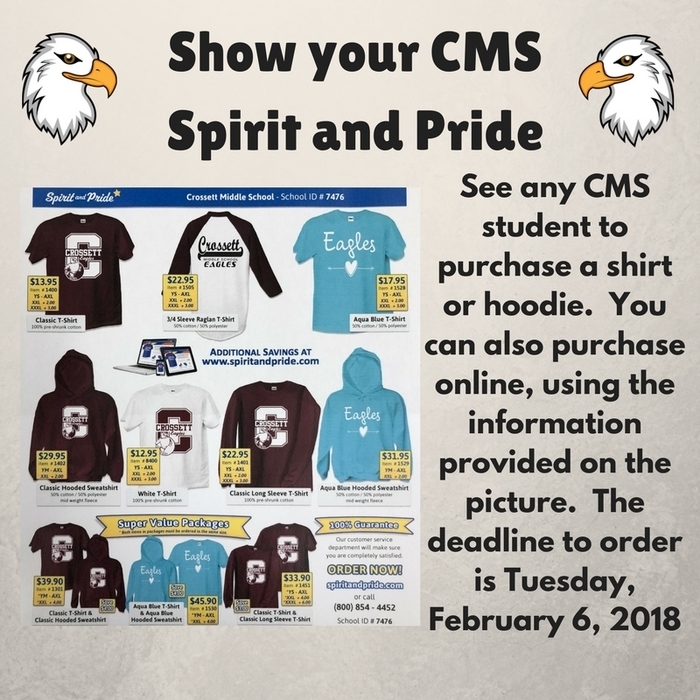 CMS is selling Spirit and Pride wear. Deadline to purchase is February 6, 2018. Maddie West has made top 5 in the talent competition at the Beta convention!!! She will perform again tonight during the general session!! Congratulations and Good Luck!!! 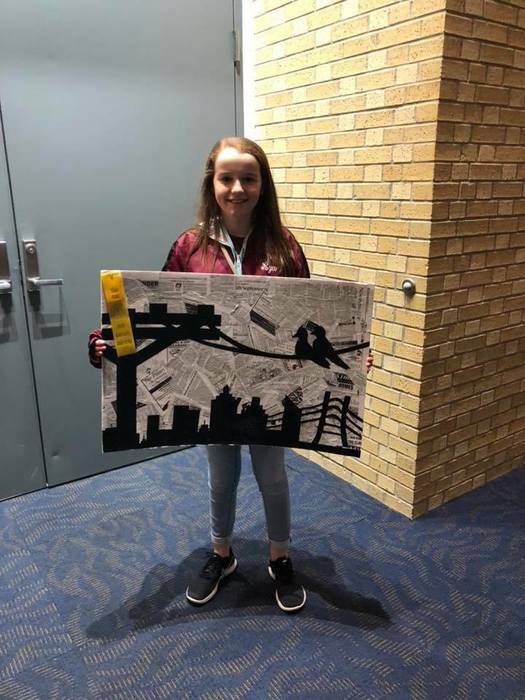 Ryan Green won 3rd in recyclable art at the Beta convention! She qualifies for Nationals!! 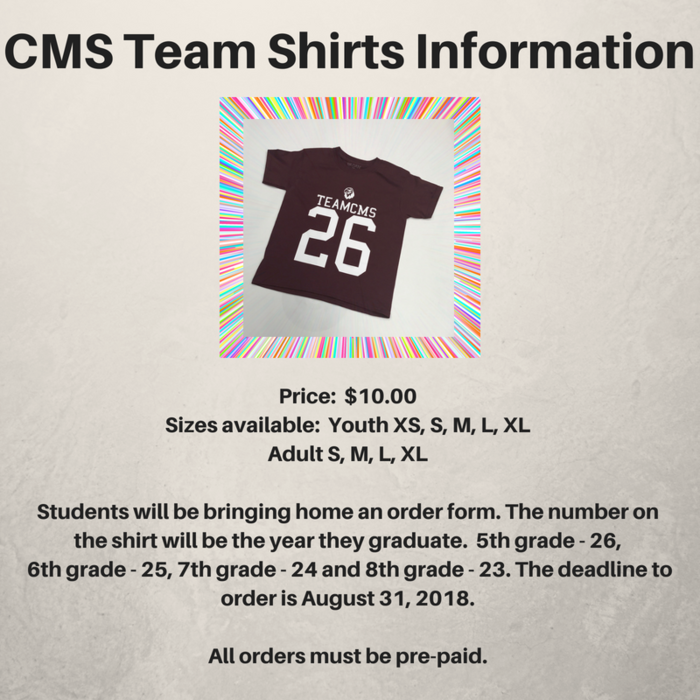 CMS is selling Spirit and Pride wear. Due to inclement weather, classes at Crossett Middle School have been canceled for Wednesday, January 17th. 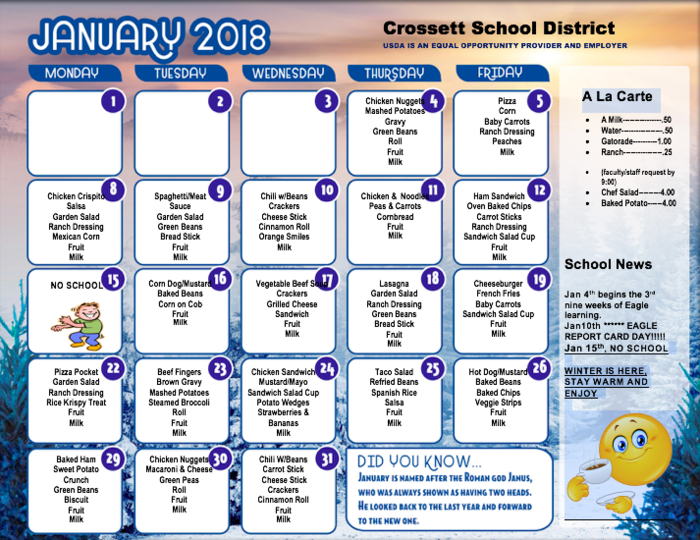 Due to inclement weather, Crossett School District has canceled classes for Tuesday, January 16th. Information about possible school closing will be announced on Channel 7 & 10; the local radio station and posted on FB and website. The decision about school has not been made yet. Due to inclement weather, school will start two hours later today. Welcome back to school! We hope everyone had a great break! 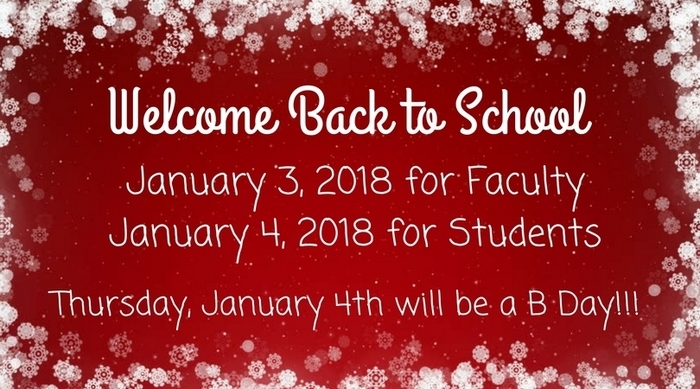 Get ready to begin the second semester on January 4th!!! 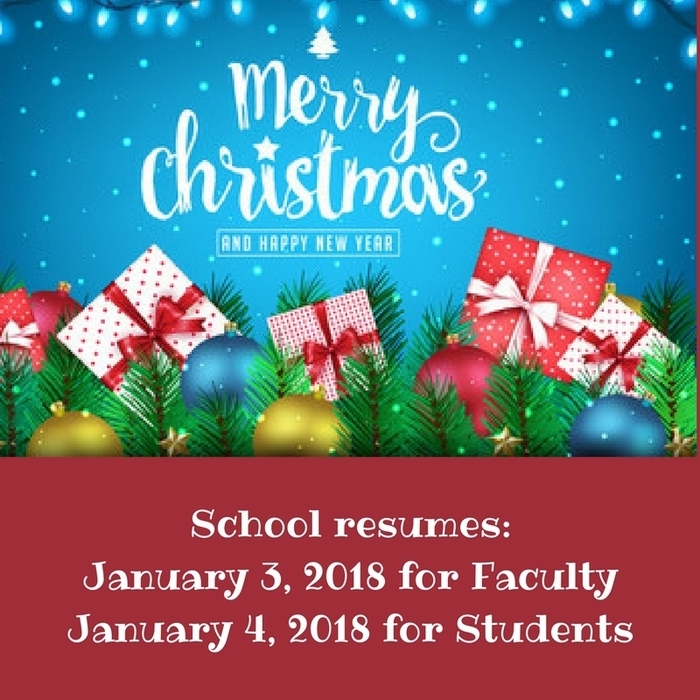 Merry Christmas and Happy New Year from Crossett Middle School. 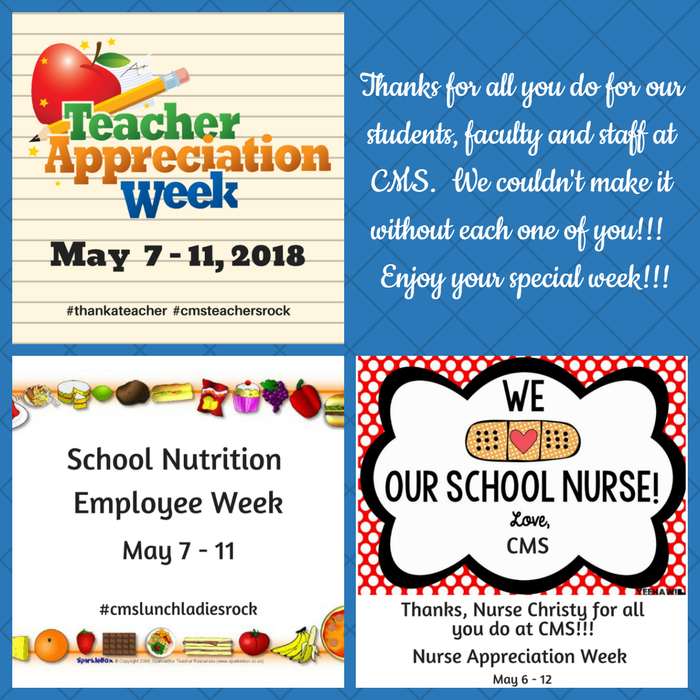 The generosity of the faculty and staff here at Crossett Middle School is absolutely amazing! We would like to thank everyone who participated in our "Christmas secret". 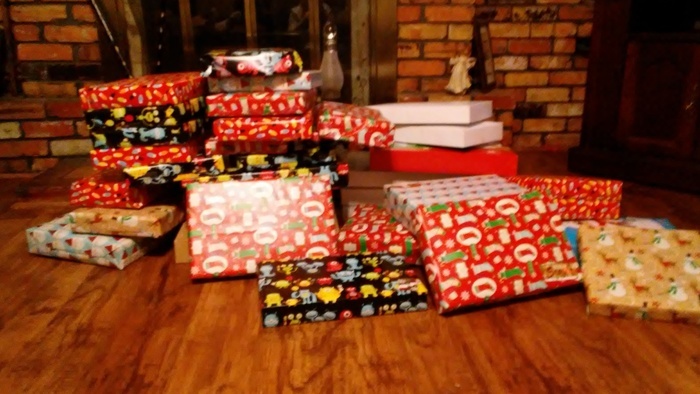 There are several students from our school who will have much better Christmas' thanks to these wonderful, giving people! The CMS Band Christmas Concert is Thursday, December 14th in the Auditorium at 6:30 p.m.
CMS Beta is sponsoring a PowderPuff Football game this Saturday, December 16th. Two games will be played, 5th vs. 6th starting at 2 p.m. and 7th vs. 8th following. Admission is $5 for adults and $3 for students. The CMS robotics team came in 7th place out of 18 teams during the Qualifying rounds at Jonesboro this last Saturday. They placed high enough to be an alliance leader in the Elimination rounds. The team's alliance group came in 2nd in the elimination round. Congratulations!!! 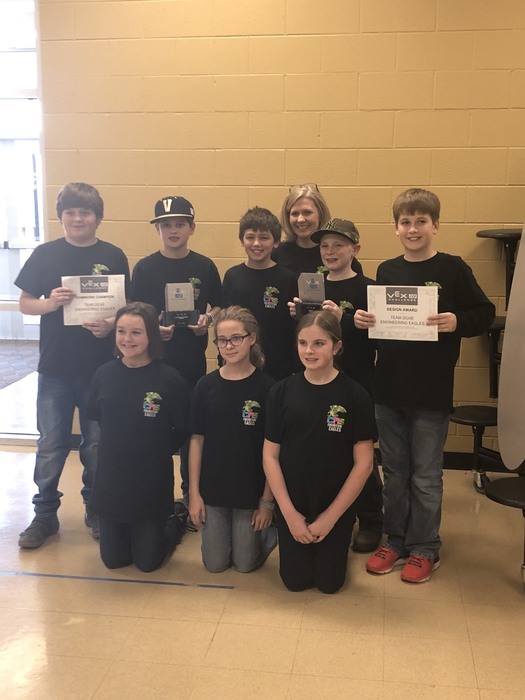 The 5th and 6th grade GT Vex robotic teams competed in Jonesboro this past Saturday and won the Teamwork Champion award (highest points scored in a single match - 99 points) and the Design Award for their robot design and engineering notebook. They qualified to compete at state in Russellville on March 3rd and at the CREATE US open championship. Congratulations!!! 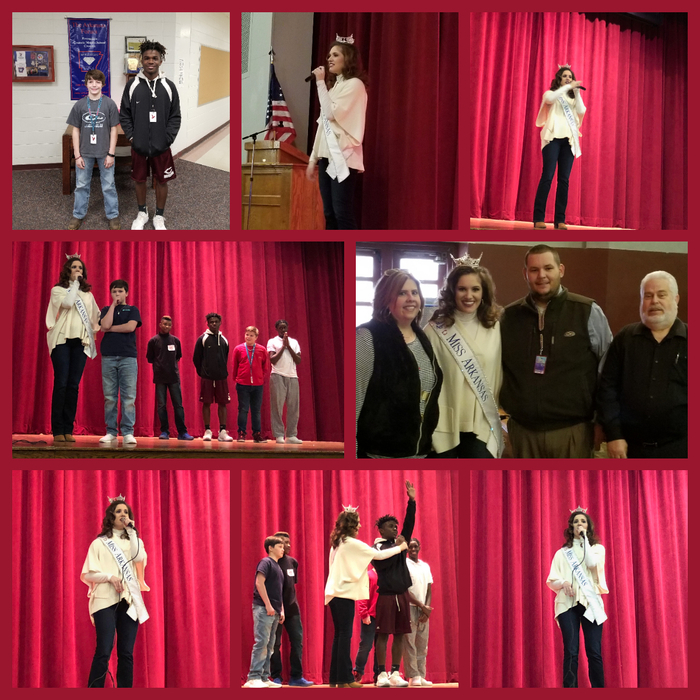 CMS students enjoyed getting to meet and hear Miss Arkansas 2017, Maggie Benton. Some of our boys even had the opportunity to participate in a Mr. Arkansas pageant. Congratulations to Max Brooks and Denzel Watkins!! CMS students enjoyed a cold Kona Ice (sno cone) on a chilly Friday!! CMS Christmas Choir concert is tonight, December 11th in the CMS Cafeteria at 6:30. CMS Band Christmas Concert is December 14th at the Auditorium at 6:30. CMS Christmas Choir concert is December 11th in the CMS Cafeteria at 6:30. The CMS Eagles EDR (8th-grade team) fought till the very last game but was bested by North Little Rock and its alliance partners!!!! The final results were: They placed 2 out of 21 in the Qualifying rounds. They won 6, lost 1, and tied 1 match. Our alliance won in the semi-finals but lost in the finals. So our alliance came 2nd overall. This is an improvement over our first meet in El Dorado where they were 9 out of 16 in qualifying and did not make it to the semifinals. 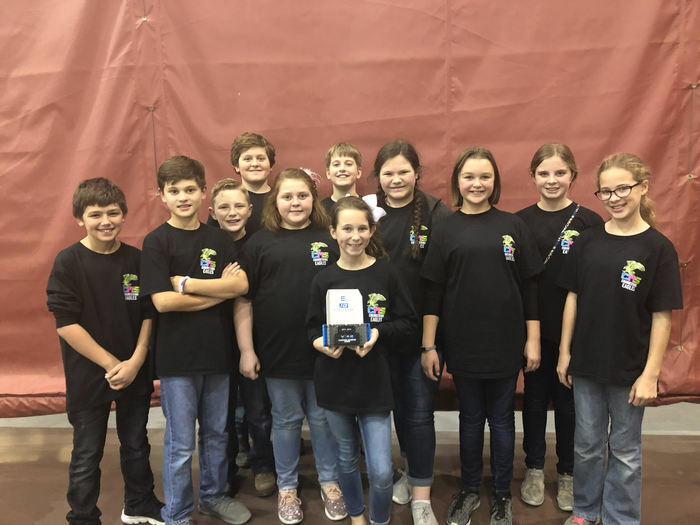 The fifth and sixth-grade robotics team won 1st place at their first Vex IQ tournament!!!!! They scored a total of 153 points in the teamwork alliance matches...2nd place was 136! Ms. Martar is extremely proud of them! 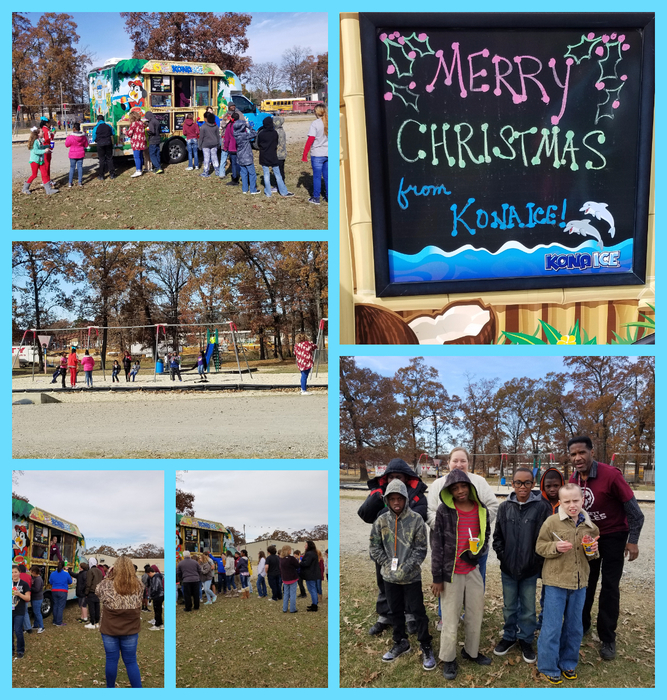 Kona Ice will be here Friday, December 8th!!! 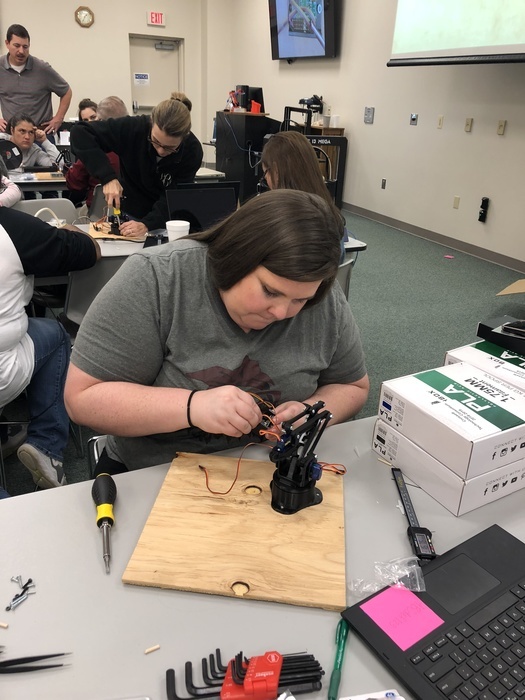 Good luck to Ms. Martar's Engineering Eagles Robotics Team and Mrs. Todd's 8th-grade Robotics team as they travel to Little Rock tomorrow to compete in the Vex competition. CMS Beta is hosting the annual Toys4Tots toy drive. You can help by bringing new toys and dropping off in our collection boxes in the office and Ms. Martar’s room. Beta members are asked to bring at least two toys but everyone can participate and help make Christmas a little brighter for the children in Ashley County. We are in need of toys for ages 7-10 but not Barbies or any dolls. They have plenty of those from last year. Thank you in advance for your generosity. Drop off deadline is Dec. 14th. Crossett Public Library is having Lego Time on Tuesday, November 21st and December 19th from 3:30 to 5:30. Orders for picture re-takes are due December 1st. Please turn in to the office. 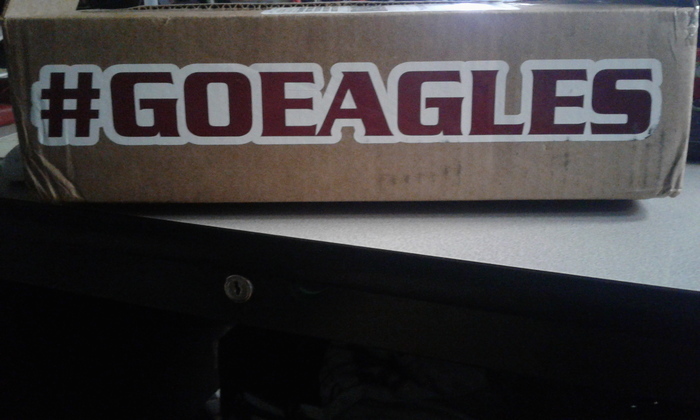 The CMS Choir will be selling #GOEAGLES bumper stickers starting this week through December 11. This would be an awesome Christmas present to anyone who has A LOT of Eagle Spirit. Bumper Stickers are $20 and all proceeds will go to help put on Madagascar: A Musical Adventure. These can be purchased from any 7/8th-grade choir student or in the CMS office. Back to School on Monday, November 27th. 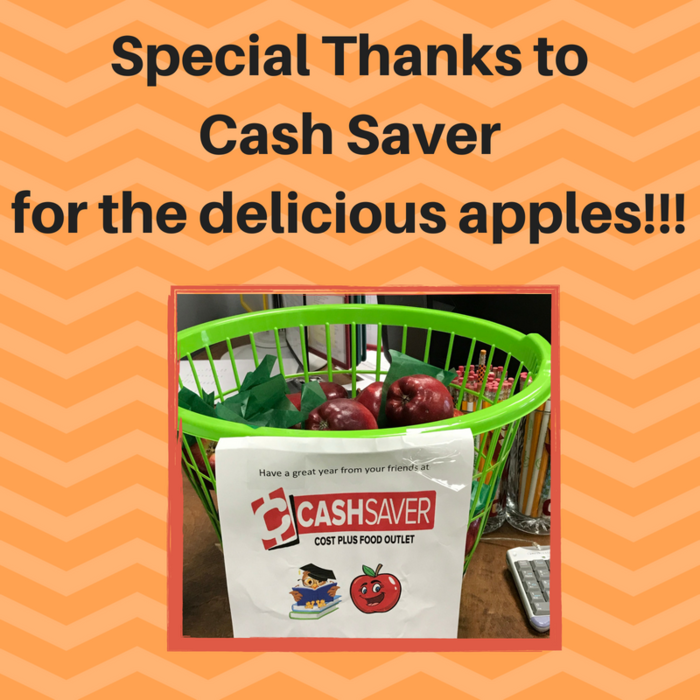 November Treat for CMS faculty and staff. 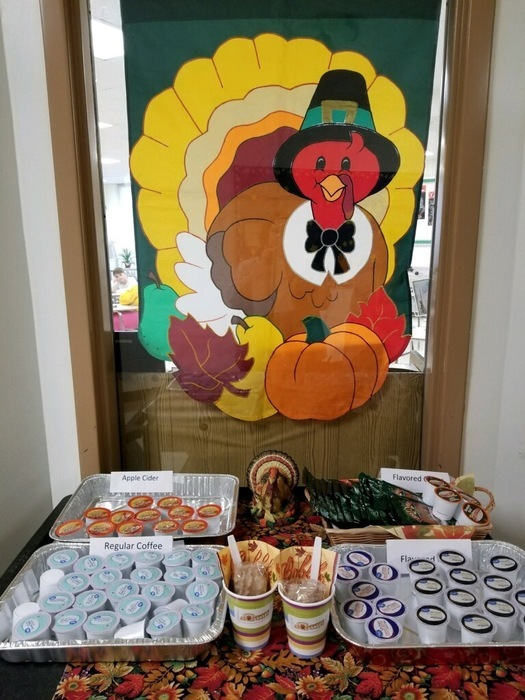 "Gobble 'til you Wobble" because we are thankful for our CMS faculty and Staff. Happy Thanksgiving!!! 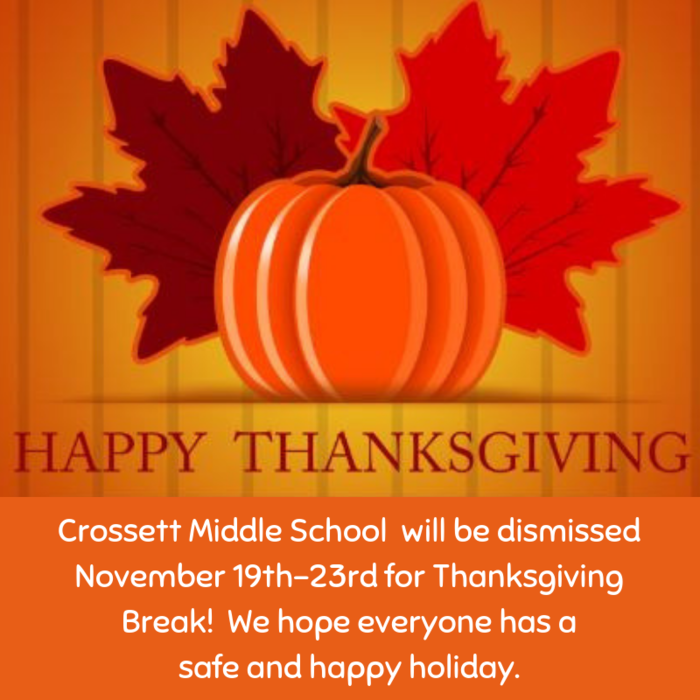 The CMS administration, faculty, and staff would like to wish everyone a Happy Thanksgiving Day and a great Thanksgiving Break (November 20-24). Students had an awesome time making music and friends at the 2017 All-Region Honor choir! 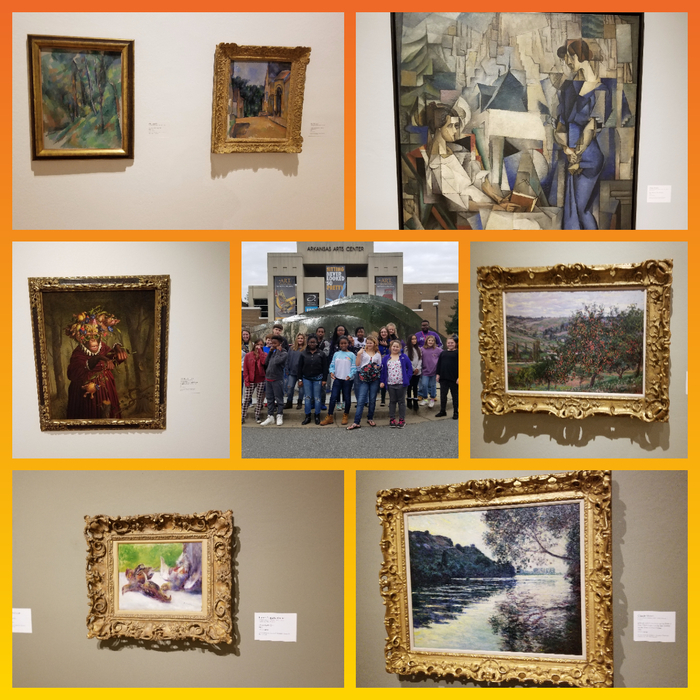 CMS students travel to the Arkansas Arts Center to explore the art exhibits. For our annual C. M. S. food drive, we are asking students to bring non-perishable food items to be donated to the Crossett Food Pantry. We will be collecting canned goods through Wednesday. 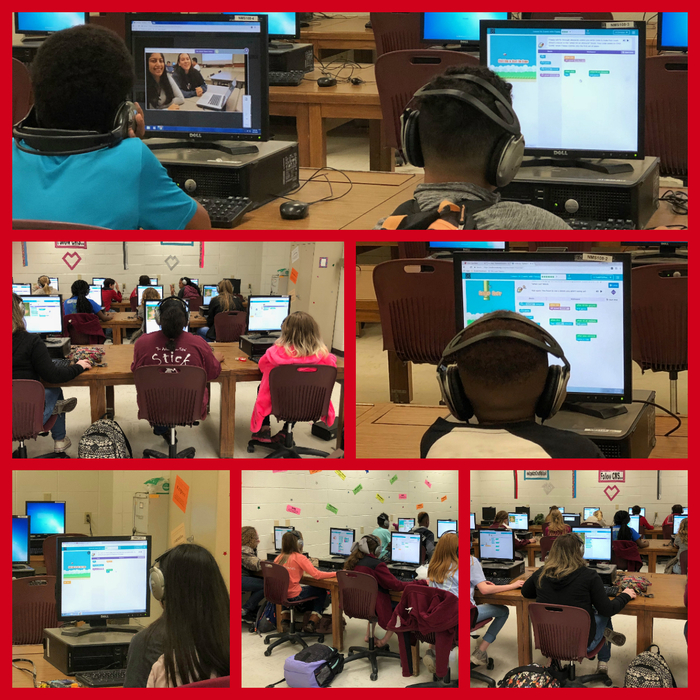 Seventh graders are learning to code and create their own games in Mrs. Jones' room. Miss Simon's math class has been hard at work learning about positive numbers, negative numbers, and absolute value! 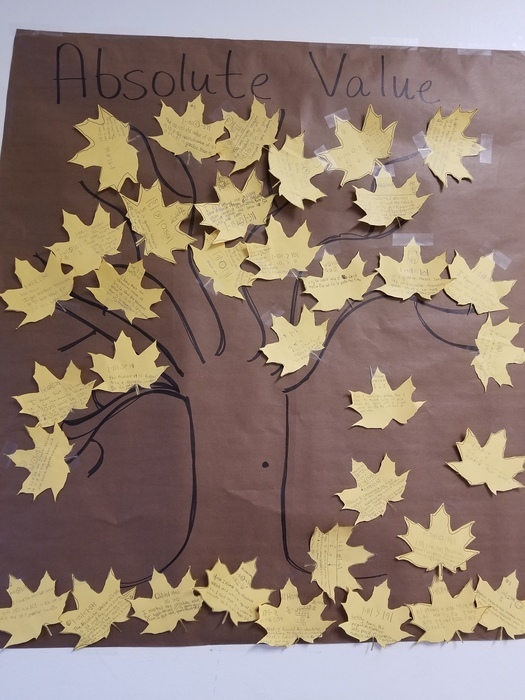 Today we made a tree with different absolute value inequality problems. 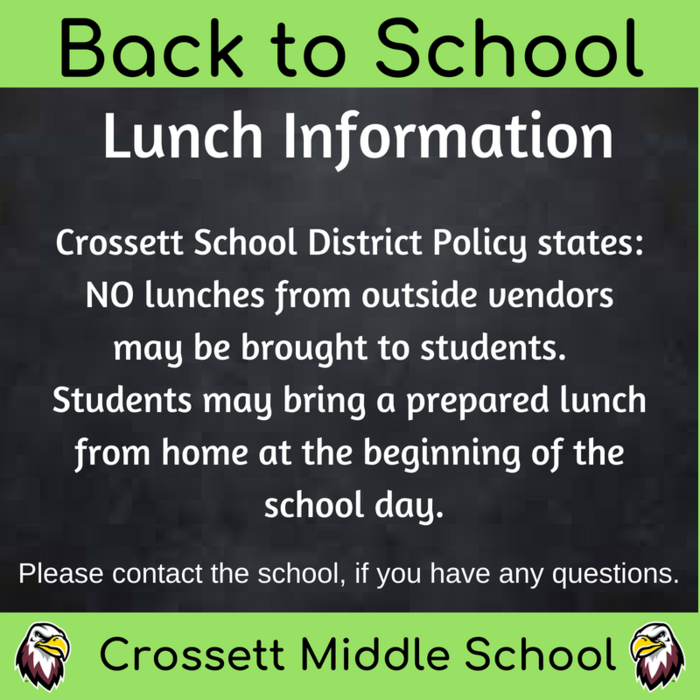 Crossett Middle School WILL be in session on Friday, November 10th. CMS Yearbooks are on sale. $35.00 for a yearbook with your name on it and $30.00 without your name. The sale ends November 17th. Hurry and get yours before the prices go up. See Ms. Tucker in Room 409 for more information. Don't forget to sign up for the Beta Club Powderpuff football game on Saturday, December 16th. We are looking for girls in grades 5-8 to play and boys to be cheerleaders. The cost is $15 and includes a t-shirt. Sign-ups will be in the office and outside Martar and Lynch's rooms. Deadline to turn in form and money is November 17th. The CMS and CES music departments will present a concert to honor our Veterans. The concert is next Tuesday, November 7th at 7:00 pm in the Crossett City Auditorium. 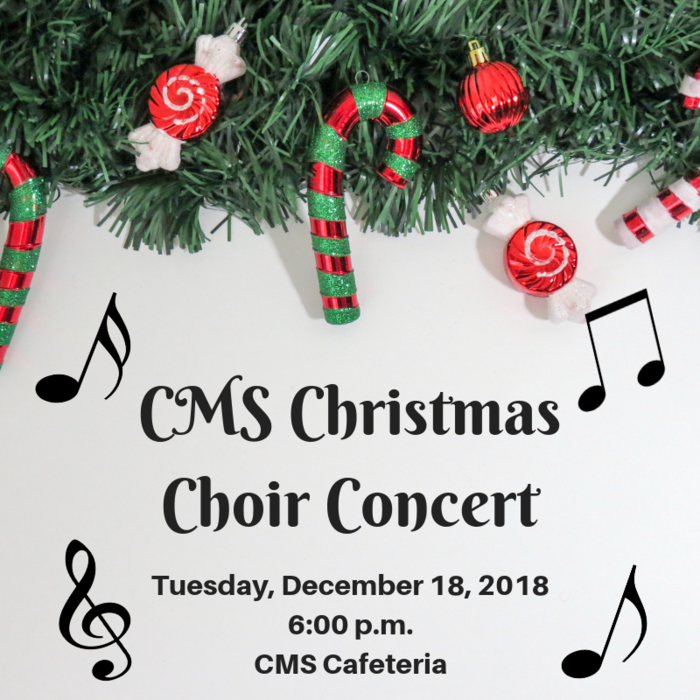 The program will feature CMS/CES choirs and the CMS Band. Please come out and celebrate the courage and bravery of our men and women in uniform. Our sixth and eighth graders will be participating in a statewide needs assessment survey on November 9th. The survey, Arkansas Prevention Needs Assessment Student Survey, is sponsored by the Arkansas Department of Human Services. The results will be used to help plan substance abuse prevention strategies and programs in our community. 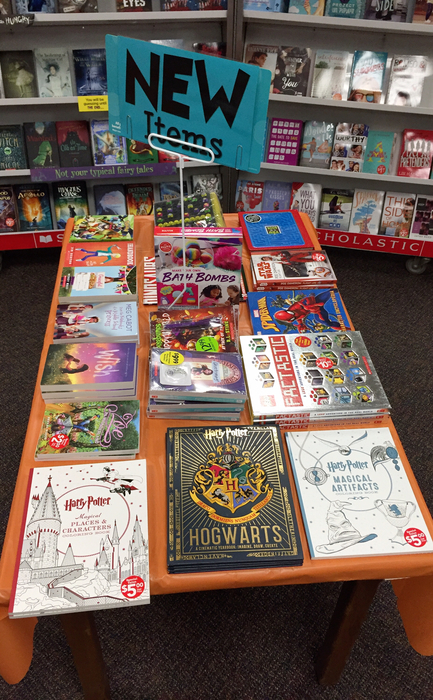 Make sure you come by the Book Fair and check out the new items that arrived today!! Costumes, masks, and face paint are not to be worn to school tomorrow. Don't forget today is Picture Retake Day!!!! Smile!!!! Don't forget about picture retakes tomorrow, October 25th. The C.M.S. Fall Title I family night will be held on Thursday, October 26th at 5:00 p.m. The first 100 C.M.S. students to register with a parent will receive a Halloween Safety Treat Bag. We will meet in the Cafeteria. Please park in the back parking area. We hope to see you there. Information about Red Ribbon Week. 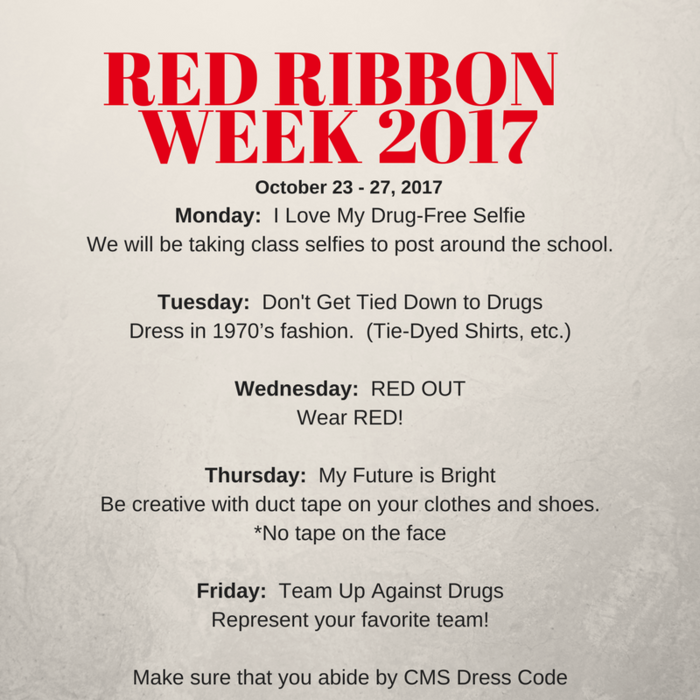 Red Ribbon Week 2017 begins next week (October 23-27). Picture orders are due tomorrow, October 20th!!! 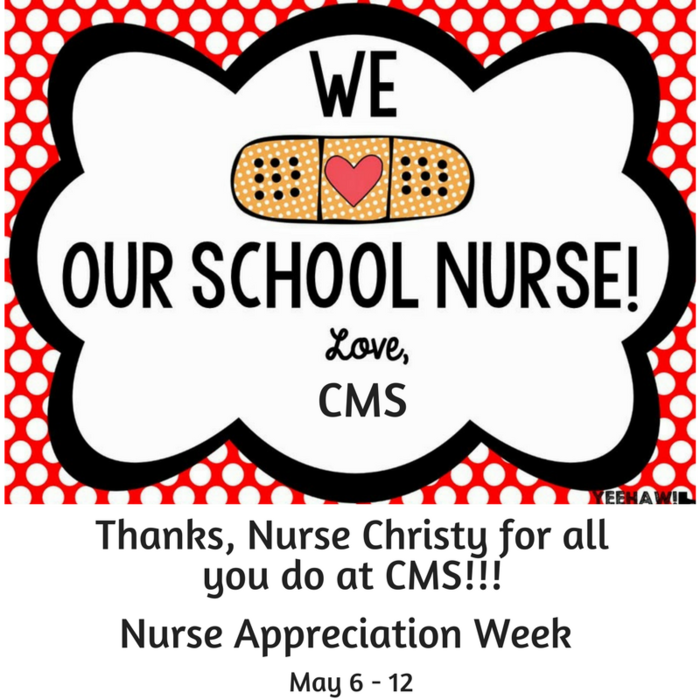 This is a reminder from CMS. Fall picture orders are due this Friday. Kona Ice will be here Friday, October 20, 2017!!! Choir Concert this evening, October 17th at 6:30 in the CMS Cafeteria. Picture retakes will be Wednesday, October 25th. Picture orders are due by Friday, October 20th. Tonights 8th grade football game has been canceled. The football game against Hamburg 8th grade has been cancelled for tonight. School is dismissed for students tomorrow. 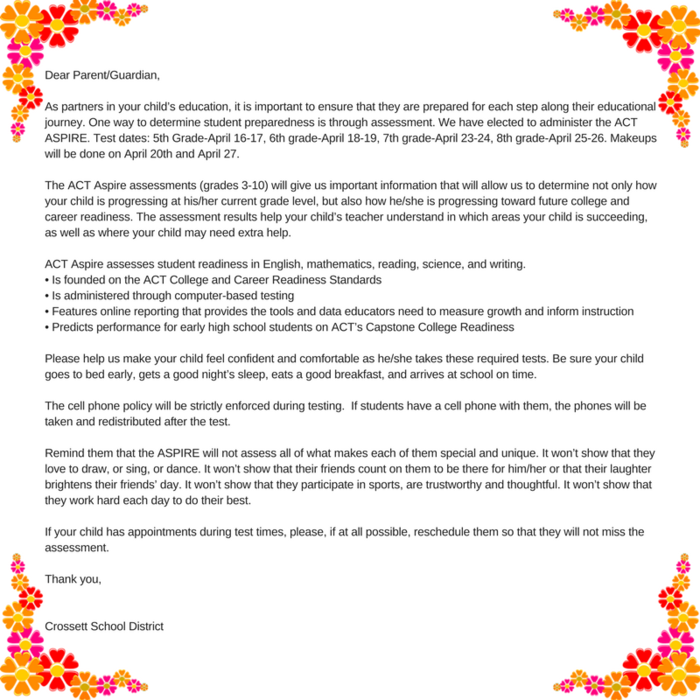 Parent/ Teacher Conferences will be held from 12 noon to 6 pm. Thanks again Arkansas Brass, Don and Lynn Rodgers!! Our first working clawbot! Way to go Friday GT!! these 5 students all worked together to build this robot. They had instructions to follow...now they have to design, plan, and build modifications to it so that it will pick up the rings and put them on the posts. So proud of them!! 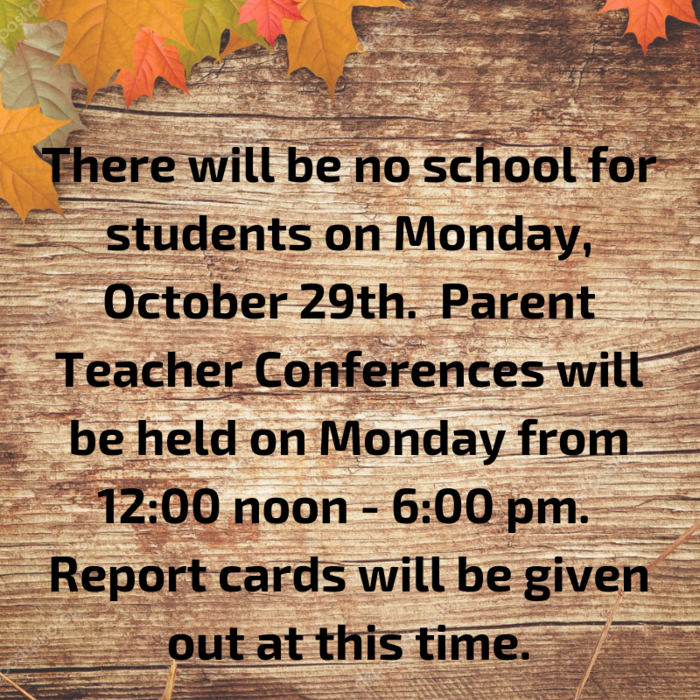 There will be No School Monday, October 16th due to Parent Teacher conferences. Conferences will be held from 12 noon until 6 pm. We look forward to visiting with you. SROs showing off their Eagle spirit!!! CMS will be having a PINK OUT DAY on Thursday, October 12th. Everyone is encouraged to wear PINK to support breast cancer awareness. 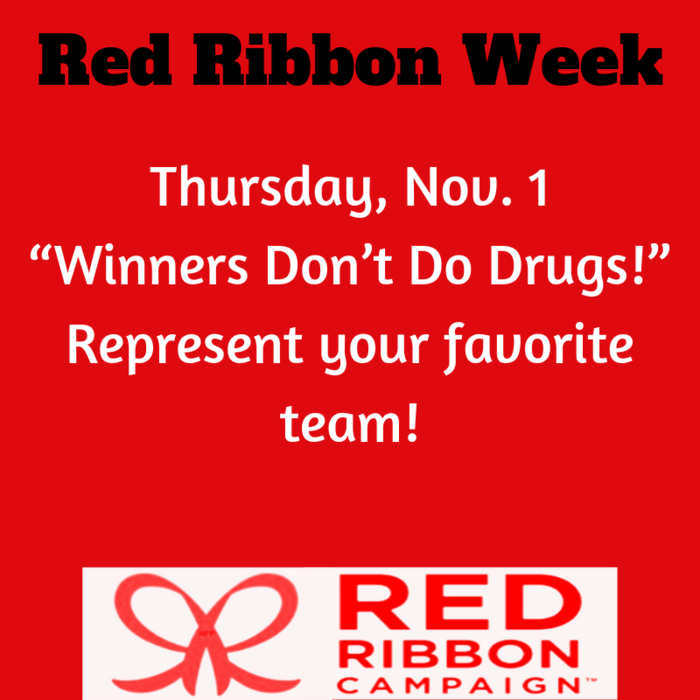 October 23-27 CMS will be participating in Red Ribbon Week. 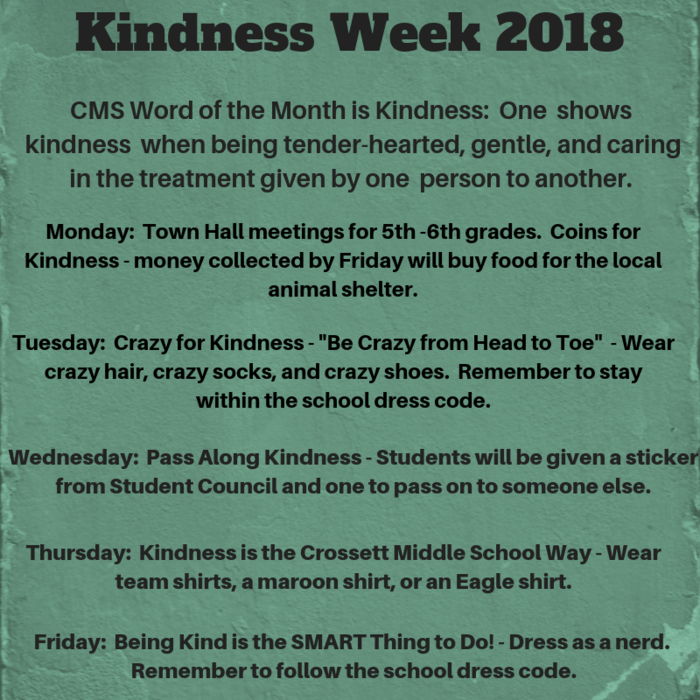 Please remember that your child still has to abide by the CMS Dress Code. 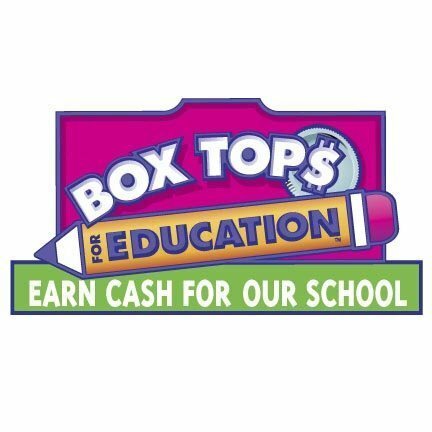 Don't forget to turn in your Box Tops for Education! There is a green bin in the office for you to place them. Thanks!!! CMS Beta club is starting a fundraiser to help pay for the hotel at convention. We have some pretty neat things like bags, wrapping paper, and kitchen gadgets. Check it out online by clicking this link www.mixedbagdesigns.com/?fundraiserid=705614 if link doesn't work, you can go to www.mixedbagdesigns.com and click "select a fundraiser to support" and then enter this ID# 705614...you can also enter a particular student's name or leave that blank. Then click shop! When ordering online, you can pay with a credit card and have it shipped to your home. Thank you in advance for your support! Please follow our new school twitter feed: @CMSEagles_News. CMS FBLA at the Fall Leadership Conference in Pine Bluff today. If any 5th or 6th Grade girl or boy is interested in Upward Basketball or Cheerleading, registration forms are in the office. There are Wiggin’s Cabin 5k/Walk and pageant forms in the office if anyone is interested. Mondays will be team shirt day. Please plan to wear your shirt every Monday. You never know when you will be rewarded for having yours on. If you did not order a team shirt and would like one, pick up an order form in the office. We will send in our last order next week. 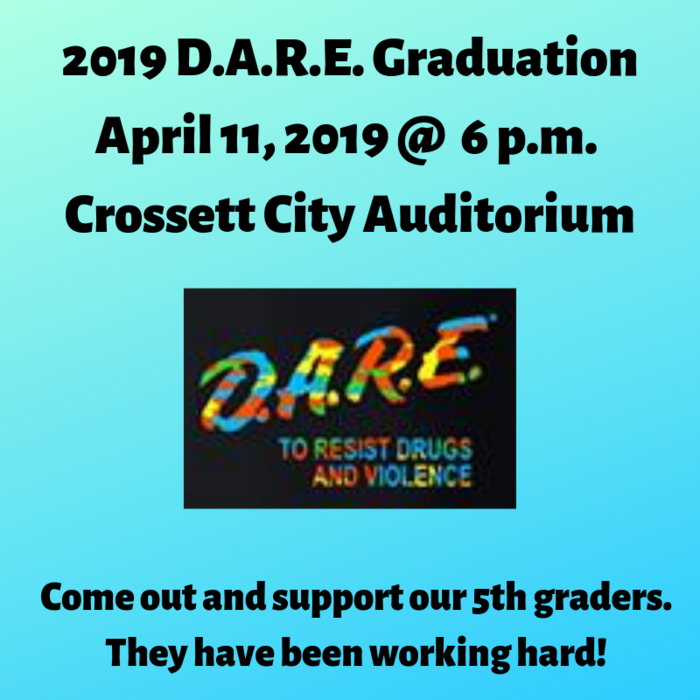 7th and 8th Graders – Dare You! Are you brave enough? Friday the 13th - Spooktacular Dance. 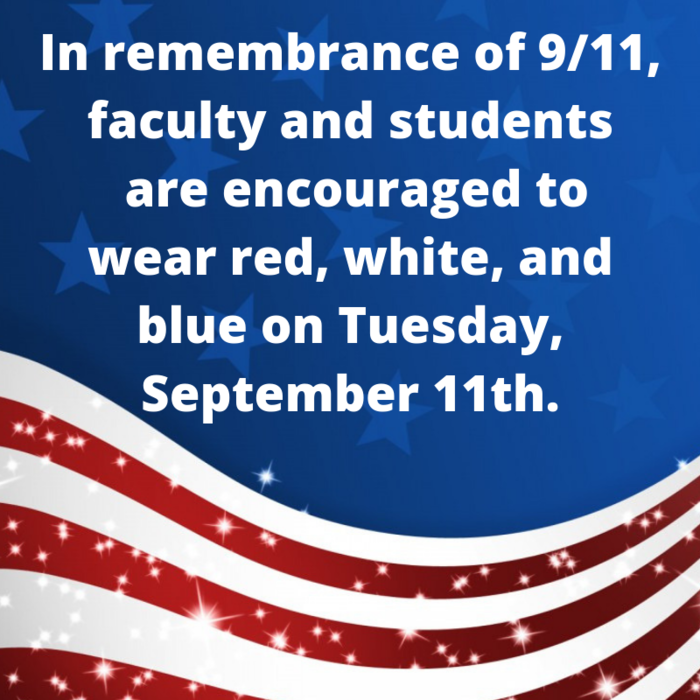 6:00 pm – 8:00 pm in the cafeteria. This dance is for 7th-8th grade ONLY. $5.00 at the door. School dress code applies. You may dress in costumes; no masks. If any 7th or 8th grade girl is interested in CMS Softball there is a sign-up form in the office. Deadline is October 6th. 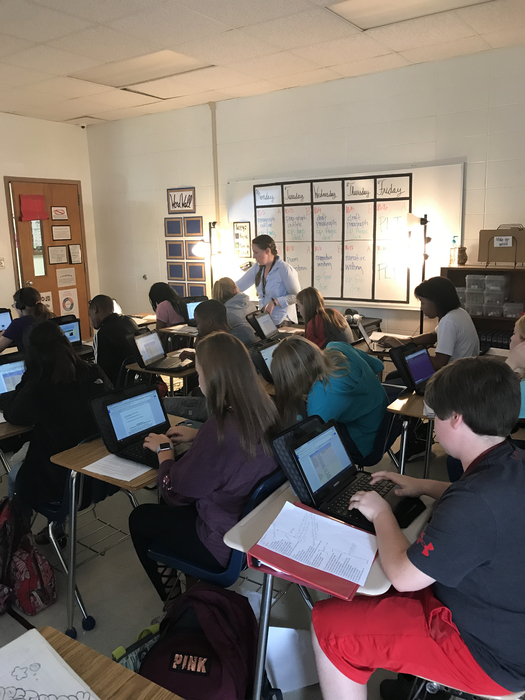 Ms. Britting's students engaged in their Summitt lesson. Today's lunch menu: Chicken Nuggets, Sweet Potato Crunch, Green Beans, Roll, Fruit, Milk. A monthly menu will be posted later today. See You at the Pole 2017. 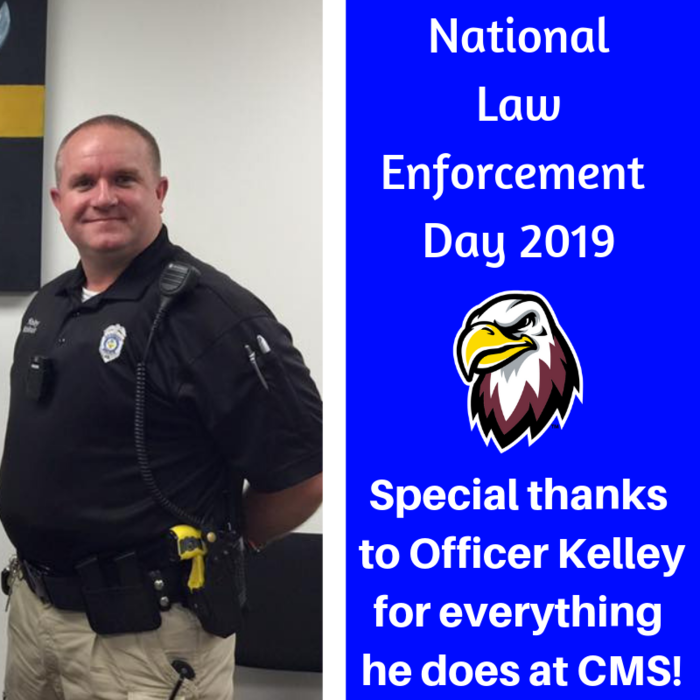 Great job by all.....special thanks to CMS Basic. CMS “See you at the Pole” is this morning at 7 am. Congratulations to the CMS FBLA officers: President - Lanee Hart, Vice President - Colin Martin, Secretary - Emma Burt, and Historian - Kaylee Hays. Congratulations to the Duke TIP Talent Search students for scoring well on their ACT Aspire. They will be given the chance to take the ACT early and get a preview of a college entrance exam. 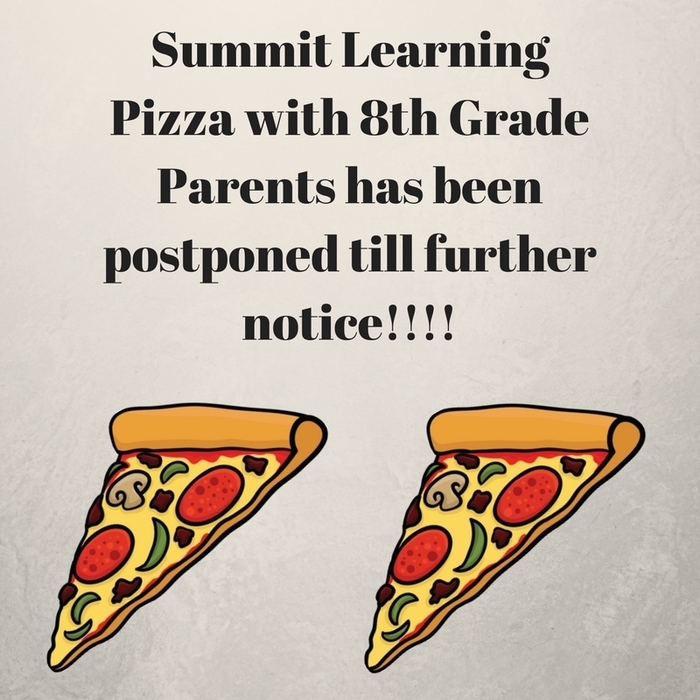 CMS tutoring is cancelled today!! 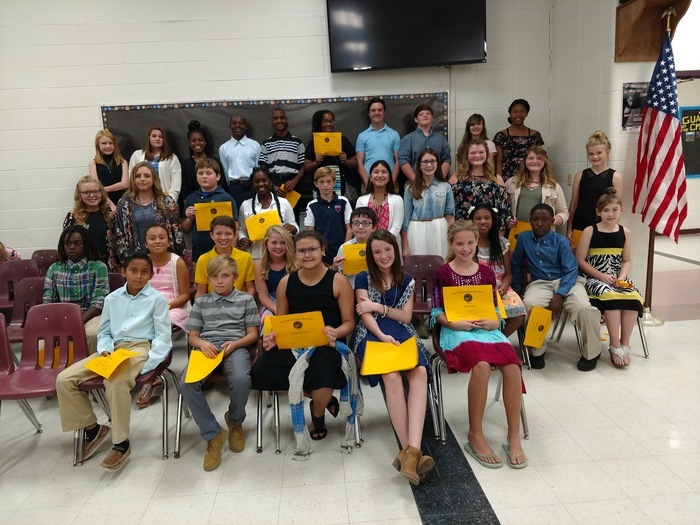 CMS Beta Induction for grades 5-8 was held last night in the CMS cafeteria. See You At The Pole is Wednesday, September 27th at 7:00 a.m. at the CMS Flag Pole. 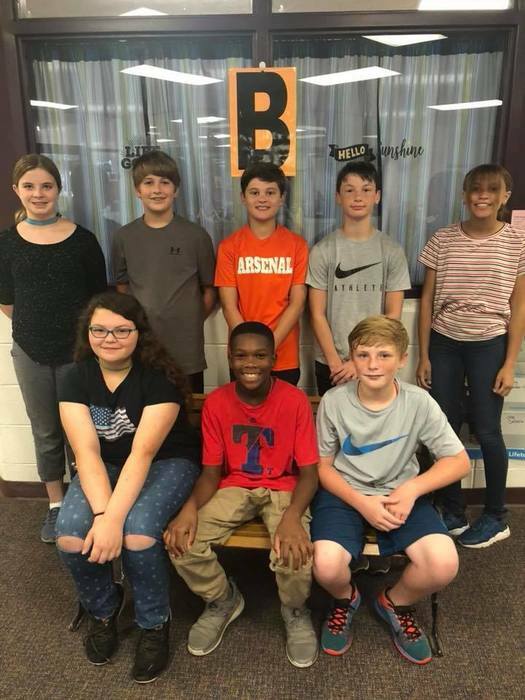 The 2017-18 5th and 6th-grade Quiz Bowl members: Tressa Richards, Kaytlin Wright, Kaden McCloy, Blake Burford, Aiden Hampton, Carson McCone, Saylor Ross, Katie Duncan, Whitney Juarez, and Parker Taylor. Mrs. Todd’s Robotics II students are programming a toll booth and demonstrating an automated chair for Grandma's stairs. 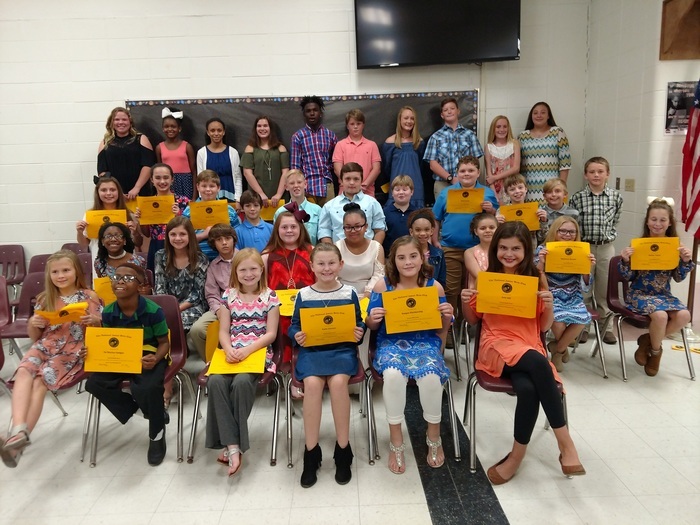 Beta club induction for new members in grades 5-8 will be held tonight (September 19th) at 6:00 pm in the CMS cafeteria. CMS has a NEW way to follow us on Twitter! 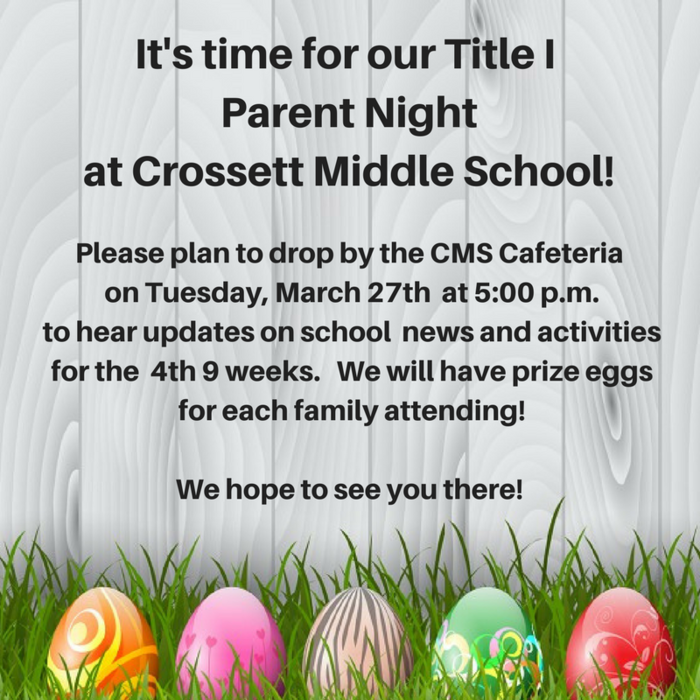 @cmseagles_news Catch up on the latest news and events!